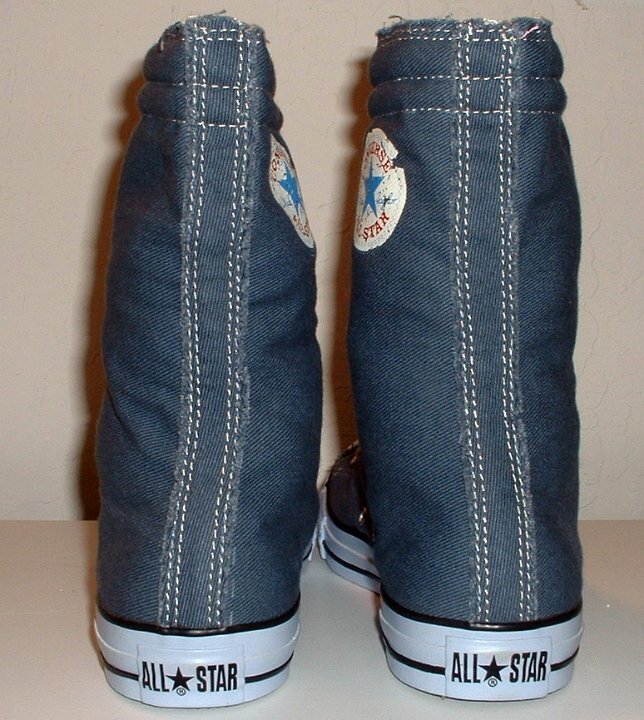 Photo gallery of various models of knee high and extra high top chucks. 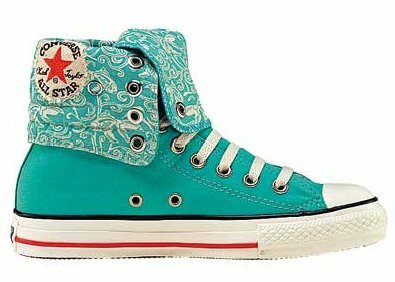 1 Knee High Chucks Left aqua and aqua pattern knee high, folded down. 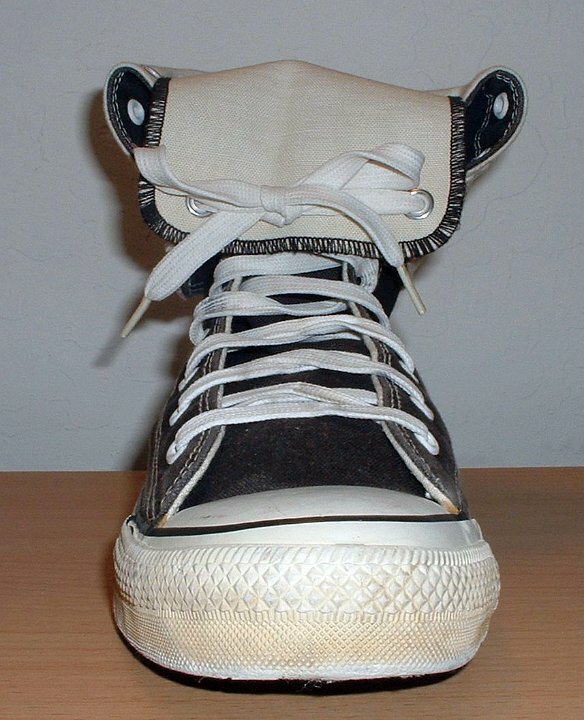 2 Knee High Chucks Side view of a folded down black knee high with fleece interior. 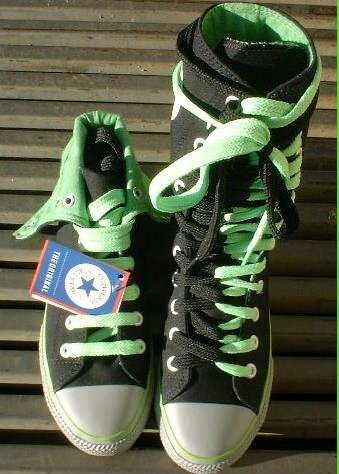 3 Knee High Chucks Black and lime green knee hi with matching laces. 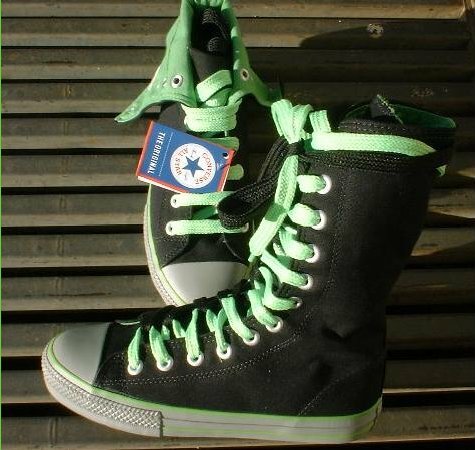 4 Knee High Chucks Black and lime green knee highs, top view. 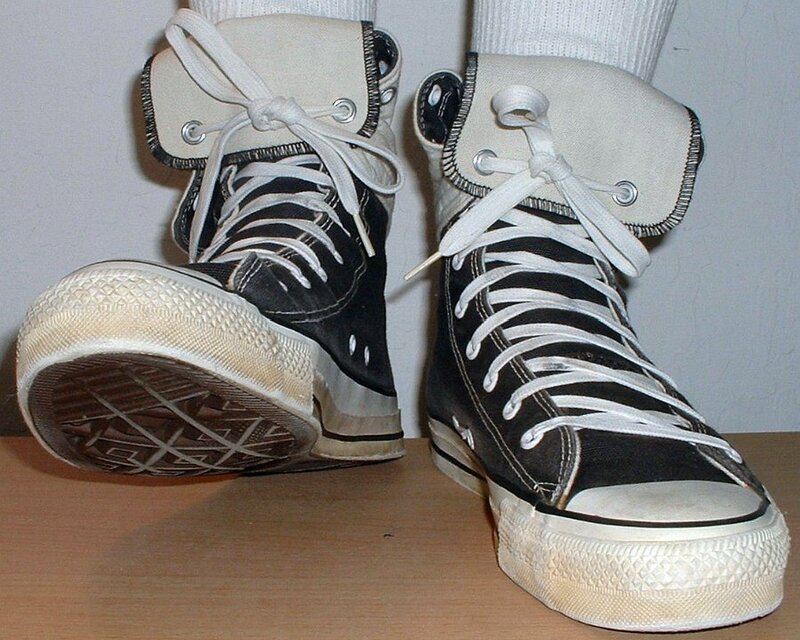 5 Knee High Chucks Black knee high with basketball. 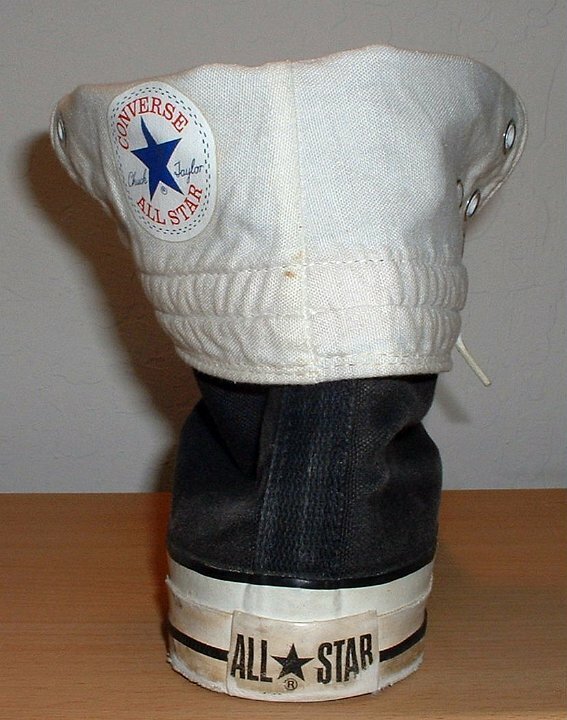 6 Knee High Chucks Left black kneehi, inside patch view. 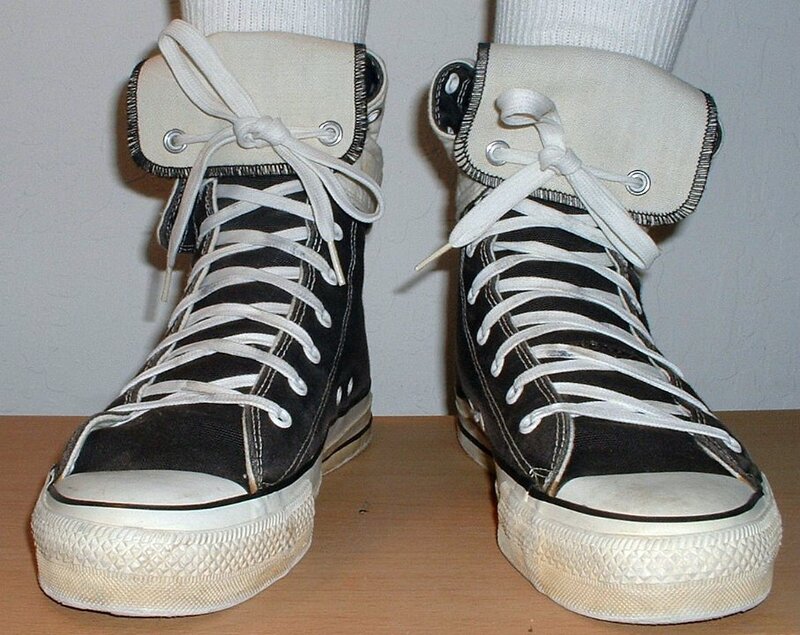 7 Knee High Chucks Right knee high with basketball. 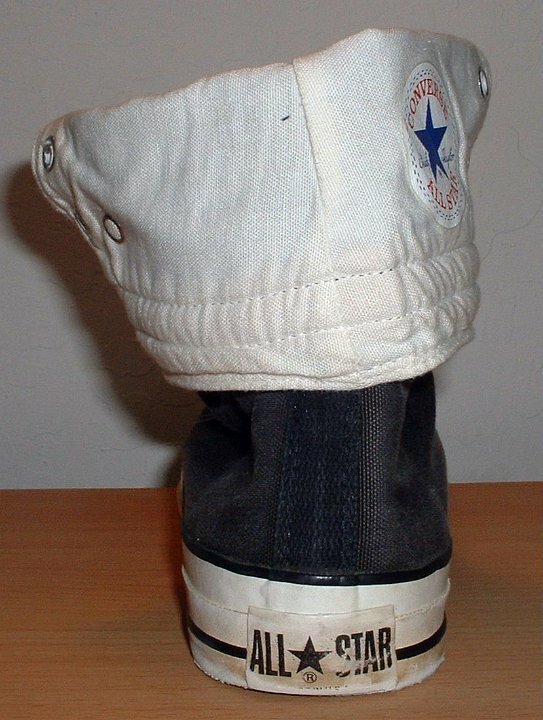 8 Knee High Chucks Left black knee high, inside patch view. 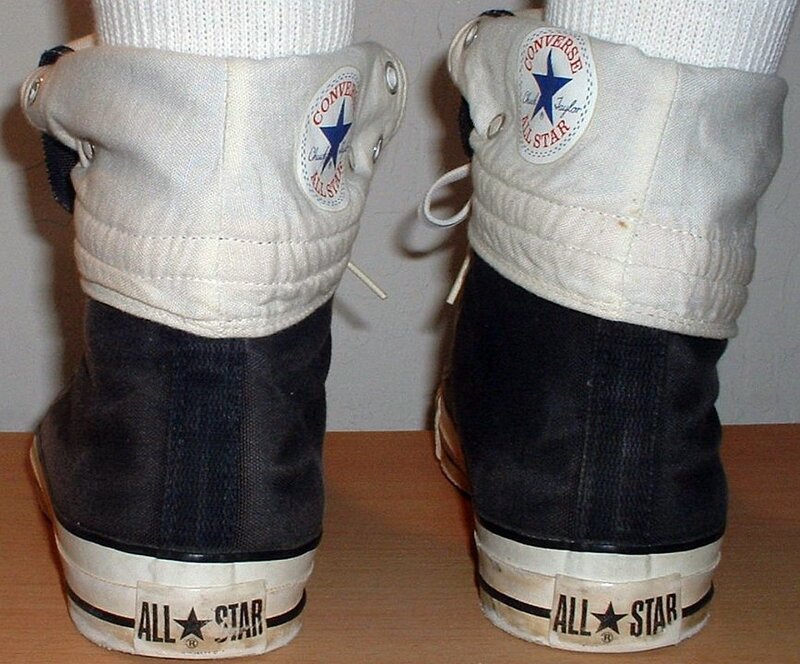 9 Knee High Chucks Sole views of black knee high chucks. 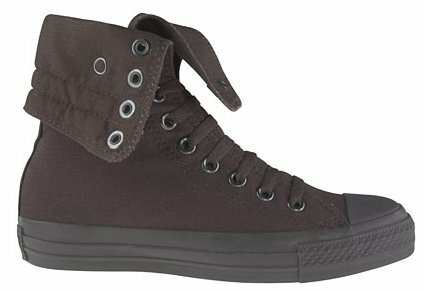 10 Knee High Chucks Left black kneehigh, inside patch view. 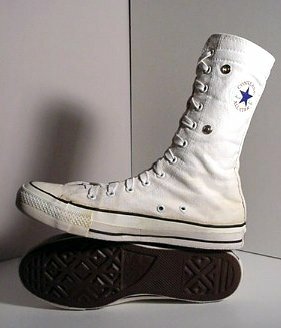 11 Knee High Chucks Black knee highs, side view. 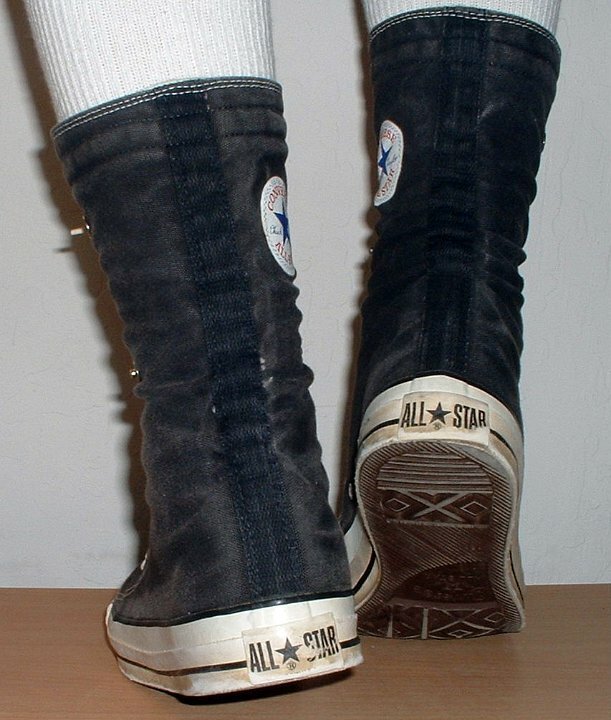 12 Knee High Chucks Black knee highs, front view. 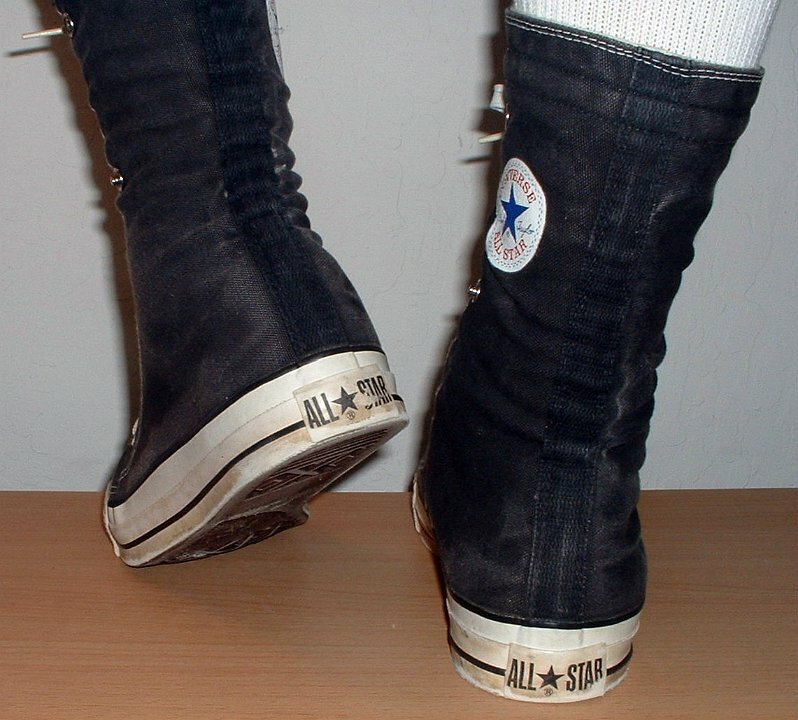 13 Knee High Chucks Black knee highs, rear view. 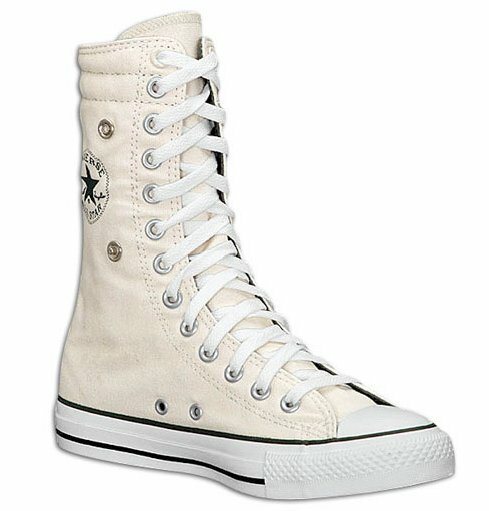 14 Knee High Chucks Right black knee high, inside patch view. 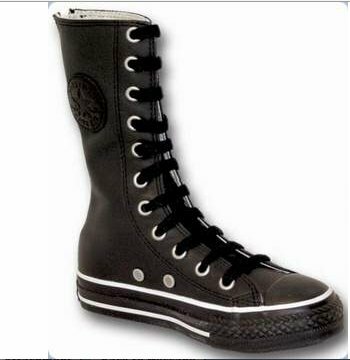 15 Knee High Chucks Right black knee high, outside view. 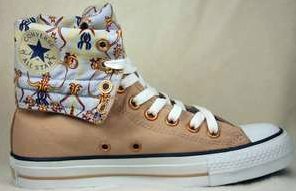 16 Knee High Chucks Left black knee high, inside patch view. 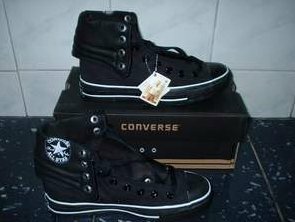 17 Knee High Chucks Black left knee high, outside view. 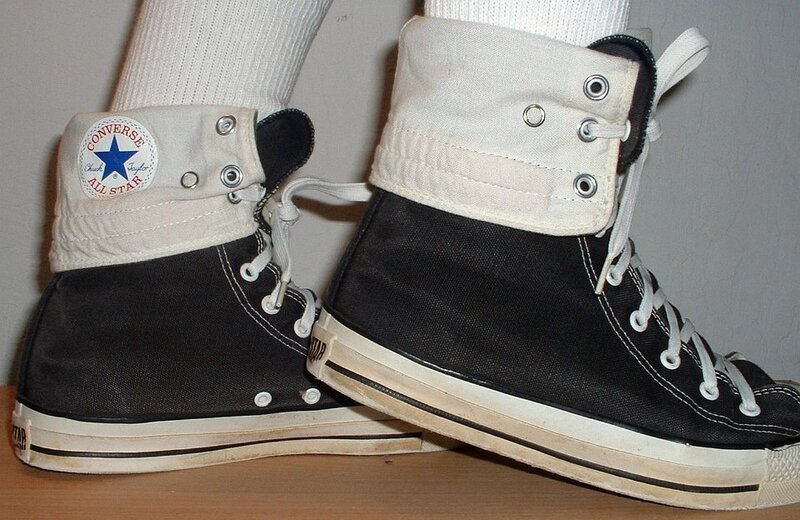 18 Knee High Chucks Black knee highs, inside patch views. 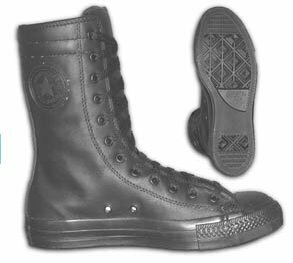 19 Knee High Chucks Right black knee high, folded down, inside patch view. 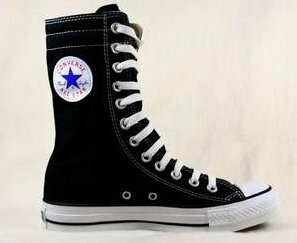 20 Knee High Chucks Right black knee high, folded down, outside view. 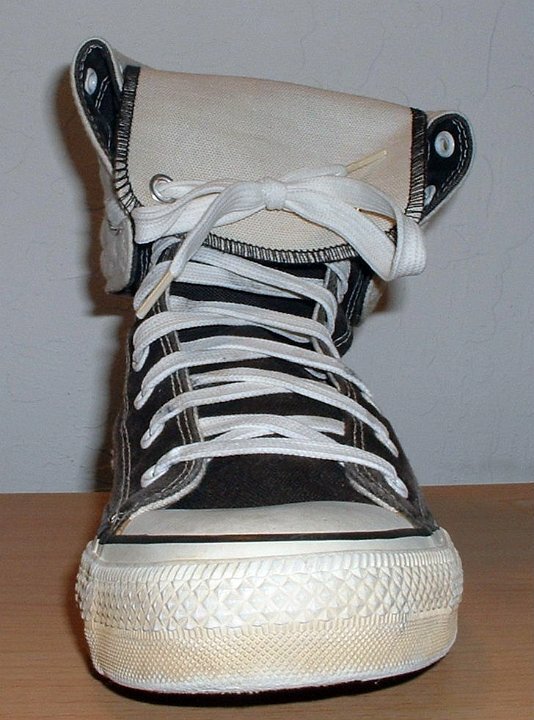 21 Knee High Chucks Black knee high, folded down, inner sole view. 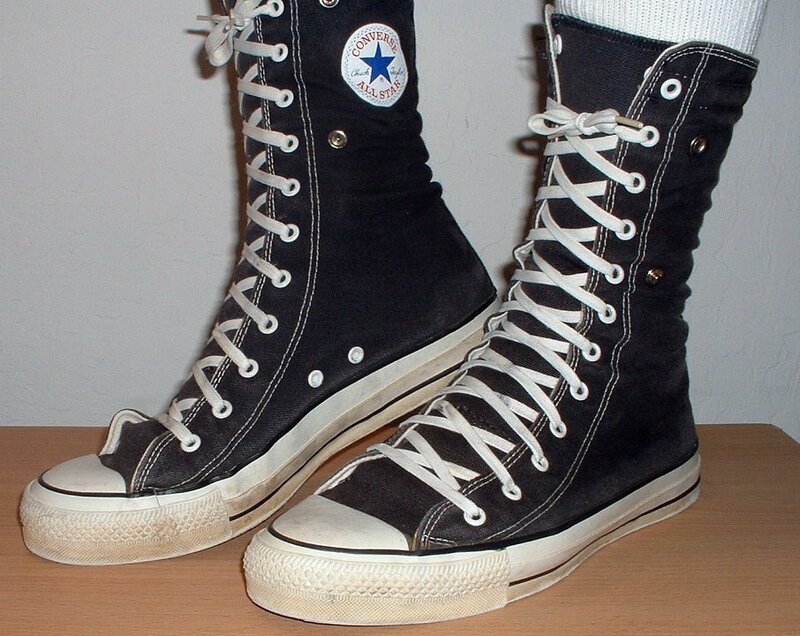 22 Knee High Chucks Right black knee high, folded down, rear view. 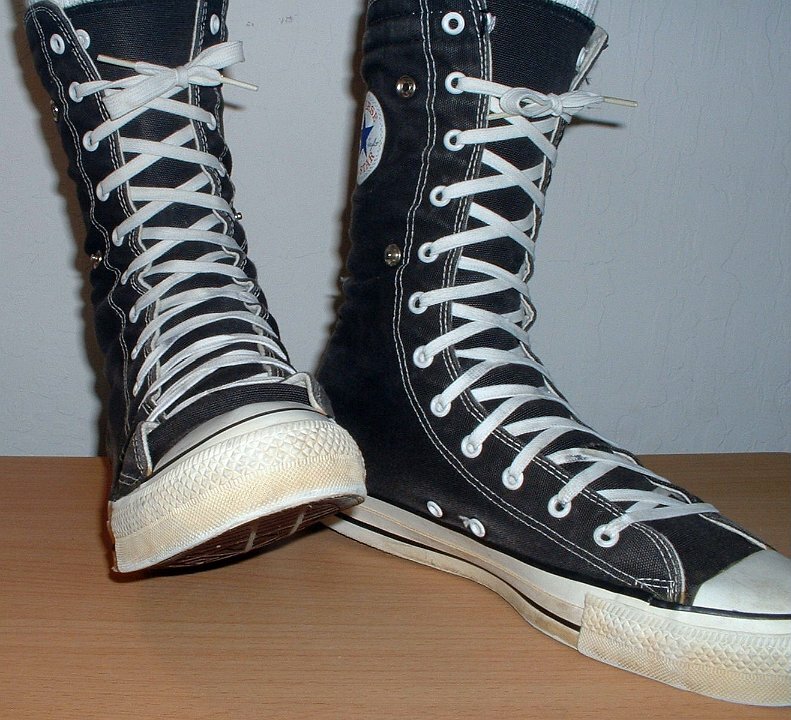 23 Knee High Chucks Right black knee high, folded down, front view. 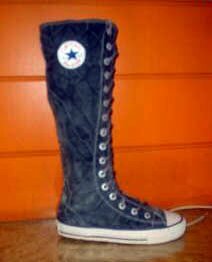 24 Knee High Chucks Left black knee high, folded down, front view. 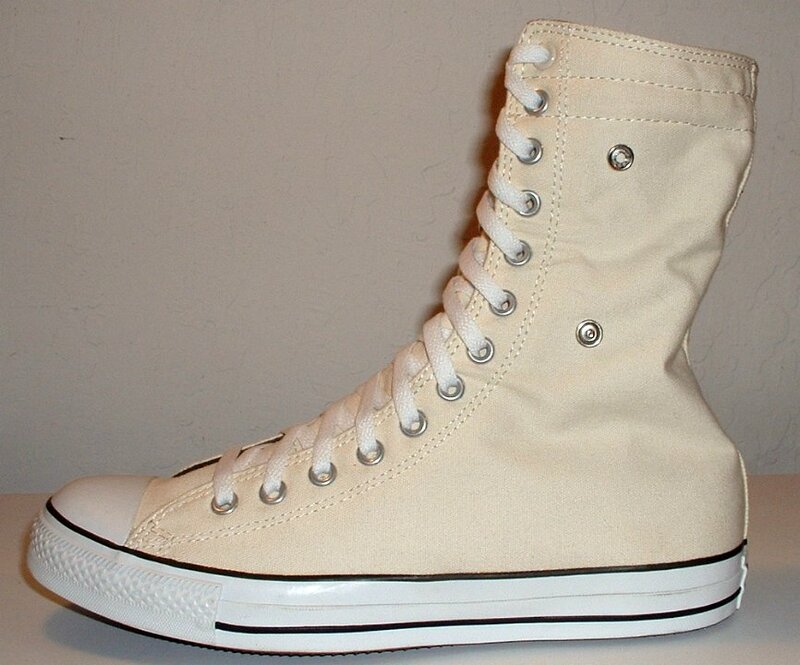 25 Knee High Chucks Left black knee high, folded down, rear view. 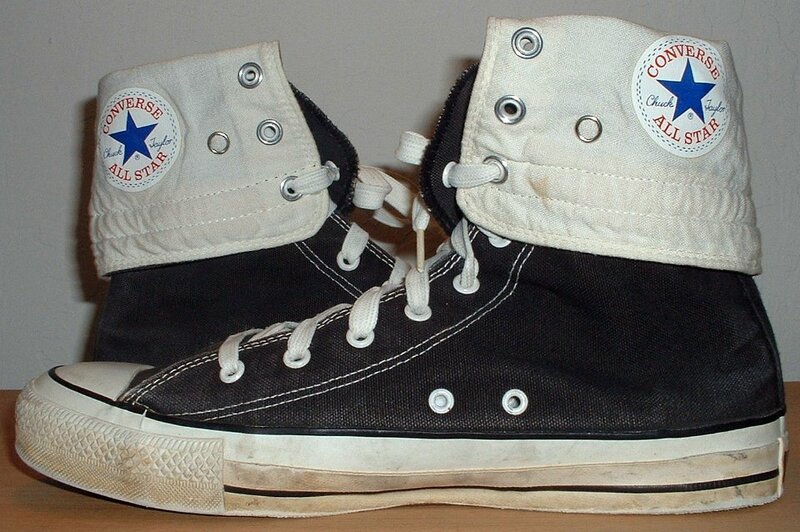 26 Knee High Chucks Black knee highs, folded down, inside patch views. 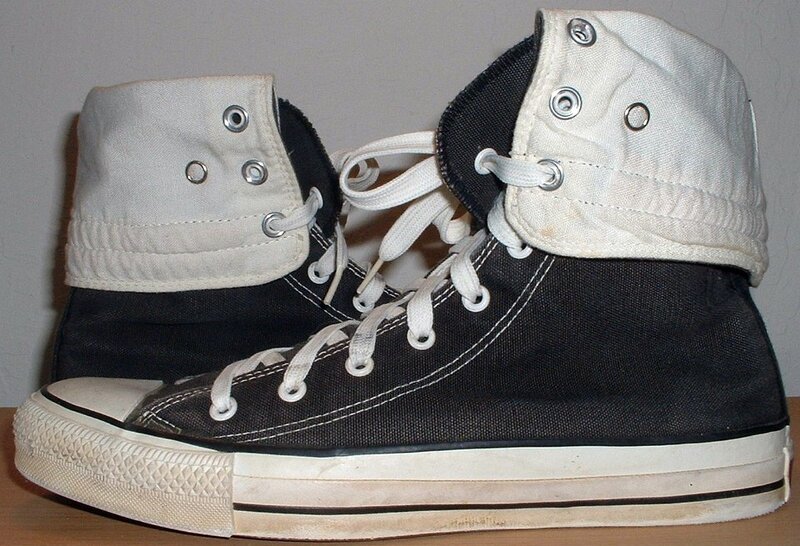 27 Knee High Chucks Black knee highs, folded down, outside views. 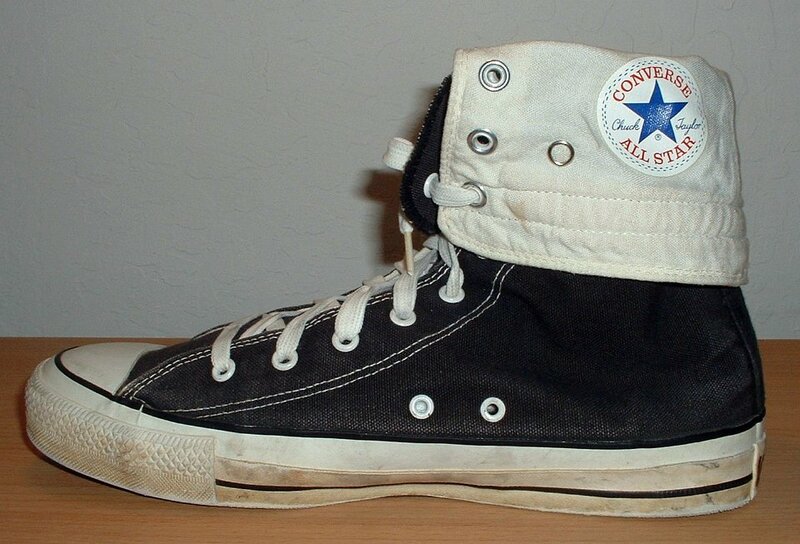 28 Knee High Chucks Black knee highs, folded down, front view. 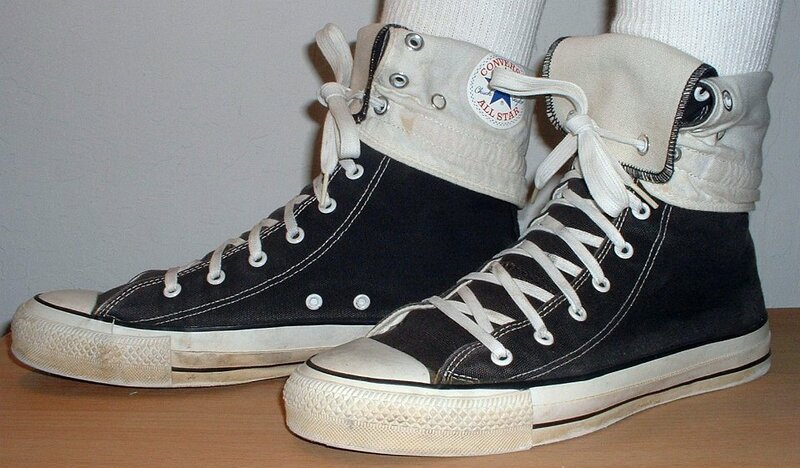 29 Knee High Chucks Black knee highs, folded down, rear view. 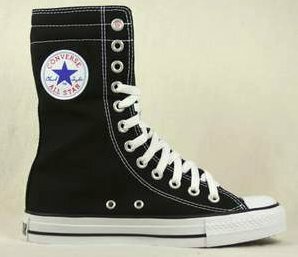 30 Knee High Chucks Wearing black knee highs, front view. 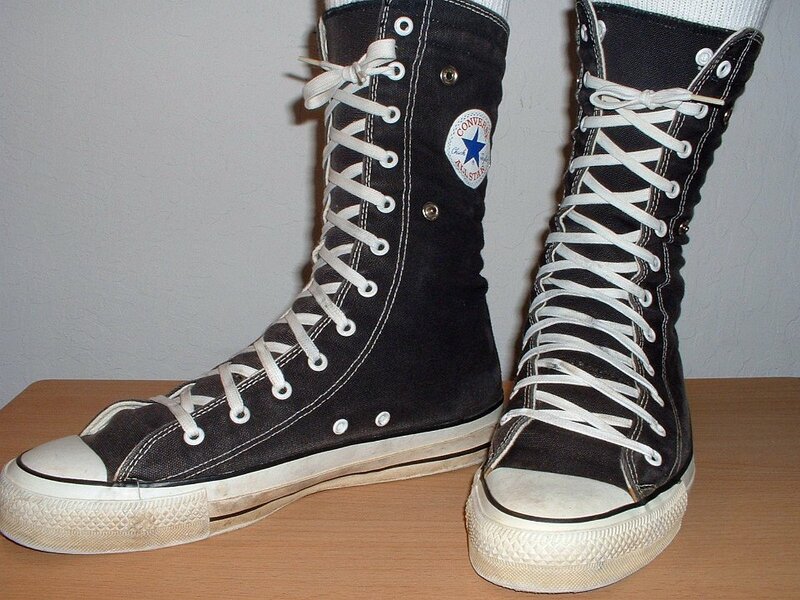 31 Knee High Chucks Wearing black knee highs, angled front and side views. Wearing black knee highs, angled side view. Walking in black knee highs, front view. Walking in black knee highs, rear view. 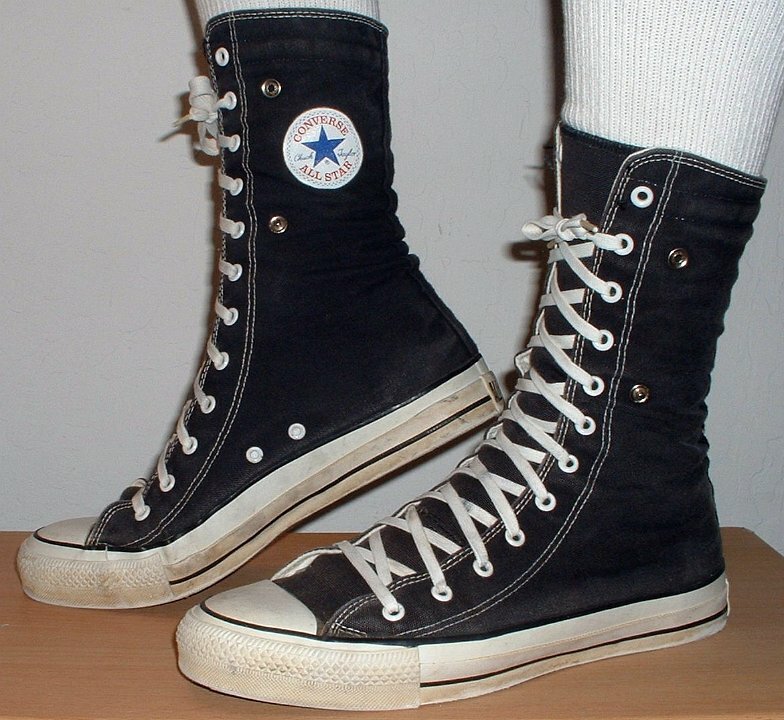 32 Knee High Chucks Wearing black knee highs, angled side view. 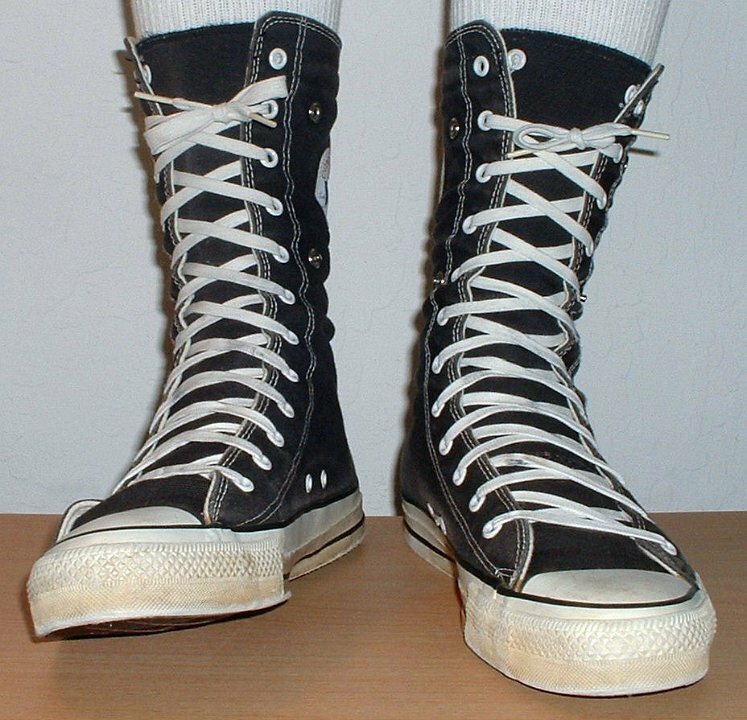 33 Knee High Chucks Walking in black knee highs, front view. 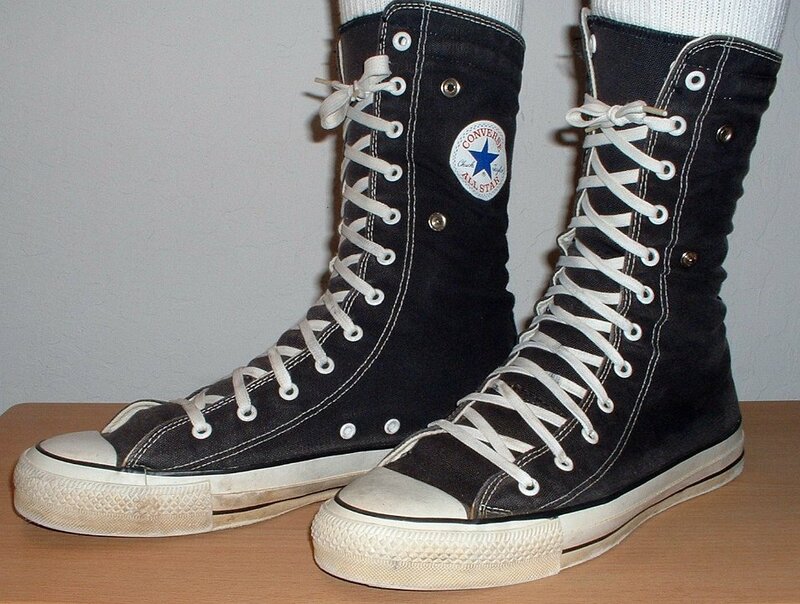 34 Knee High Chucks Walking in black knee highs, rear view. 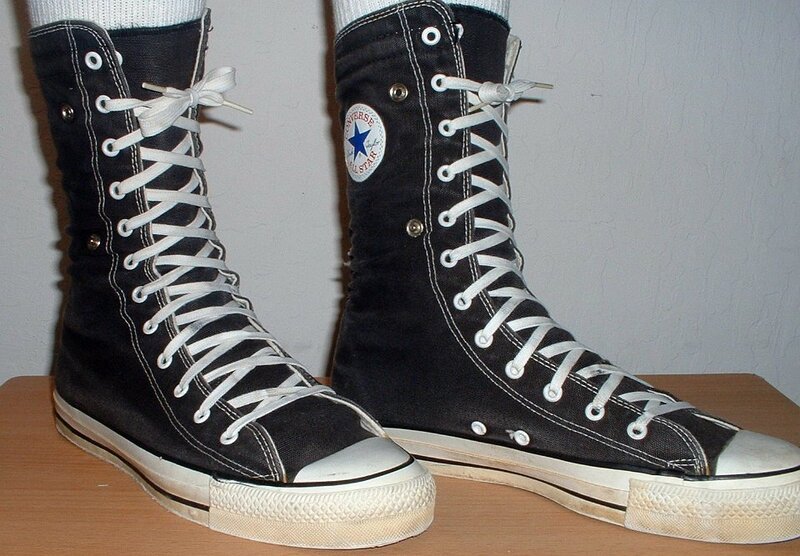 35 Knee High Chucks Wearing black knee highs, angled side view. 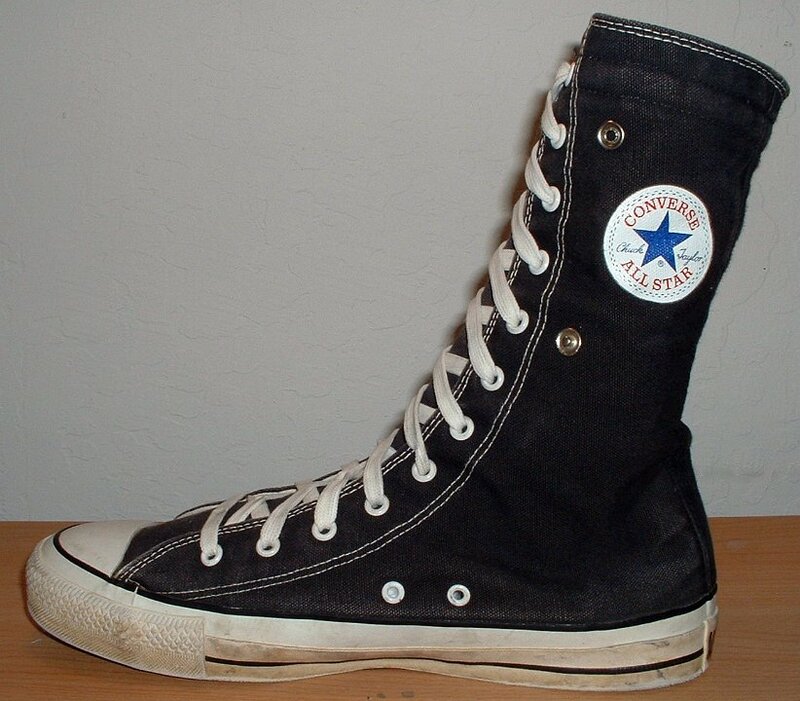 36 Knee High Chucks Wearing black knee highs, angled side view. 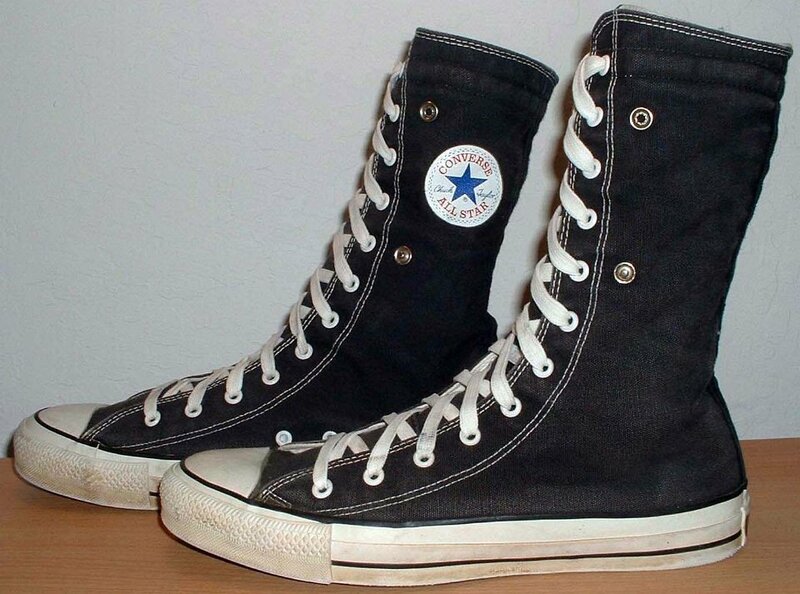 37 Knee High Chucks Wearing black knee highs, angled side view. 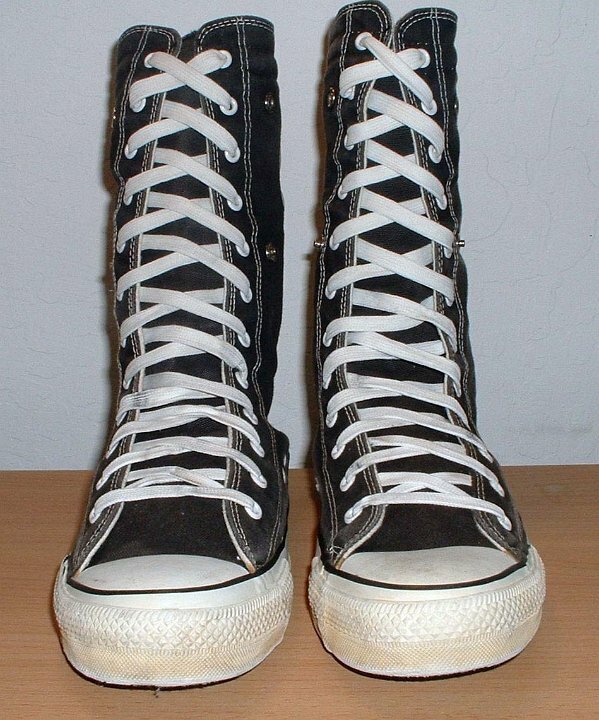 38 Knee High Chucks Walking black knee highs, front view. 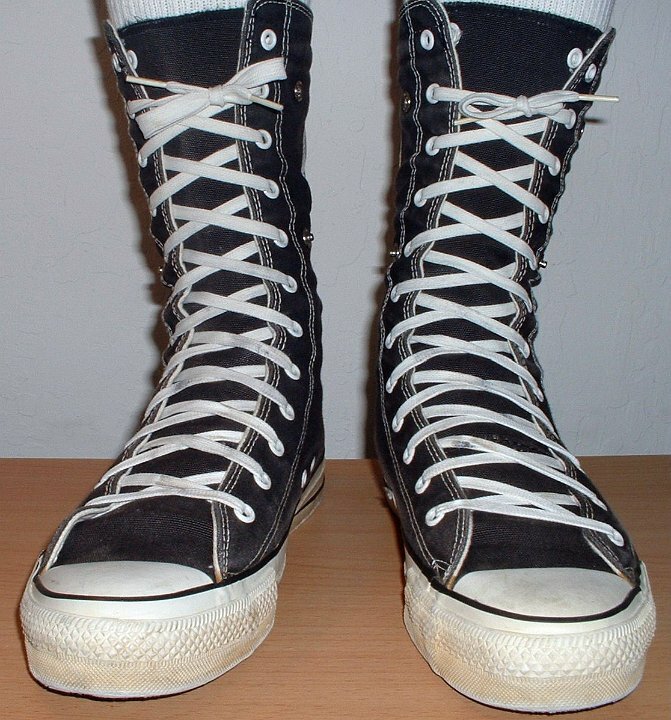 39 Knee High Chucks Walking in black knee highs, front view. 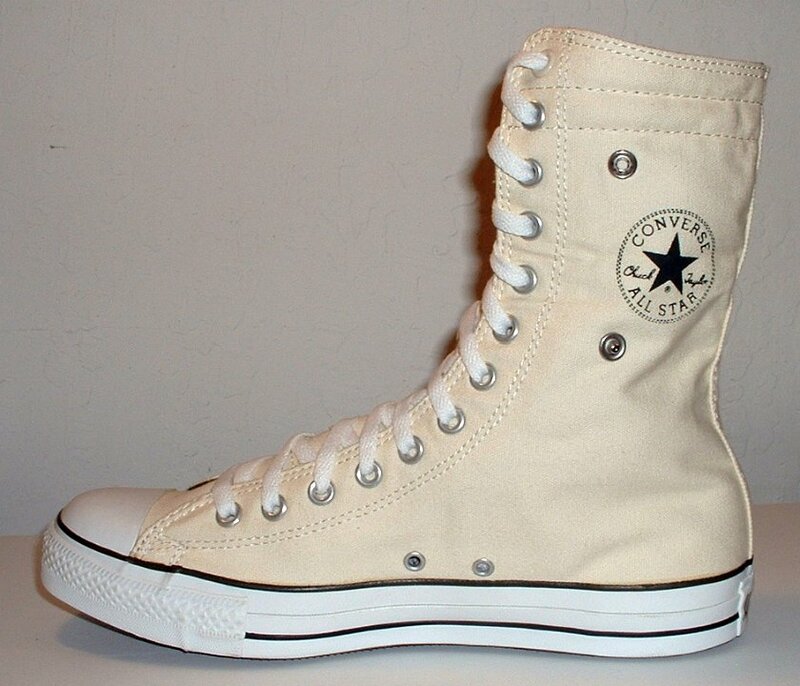 40 Knee High Chucks Stepping up in black knee highs, side view. 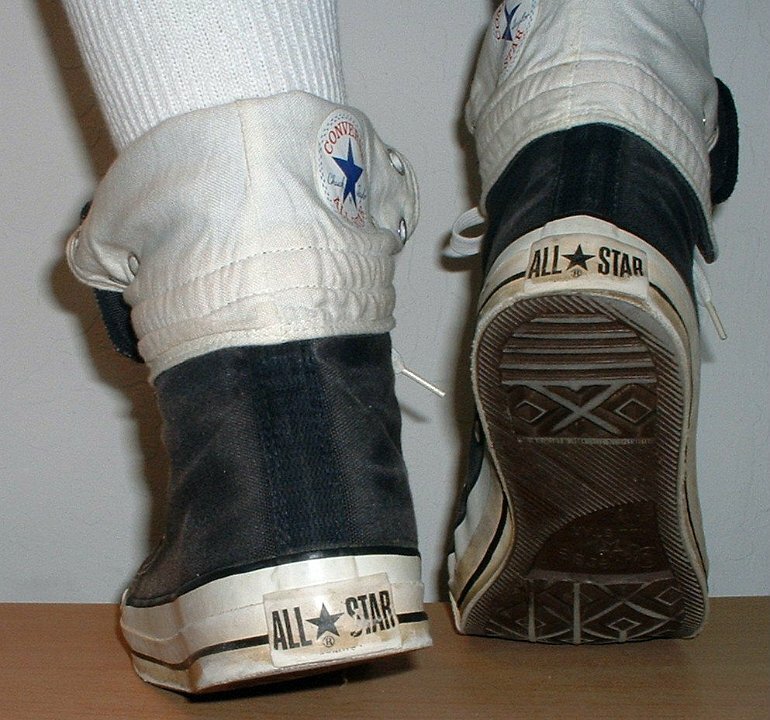 41 Knee High Chucks Walking in black knee highs, rear view. 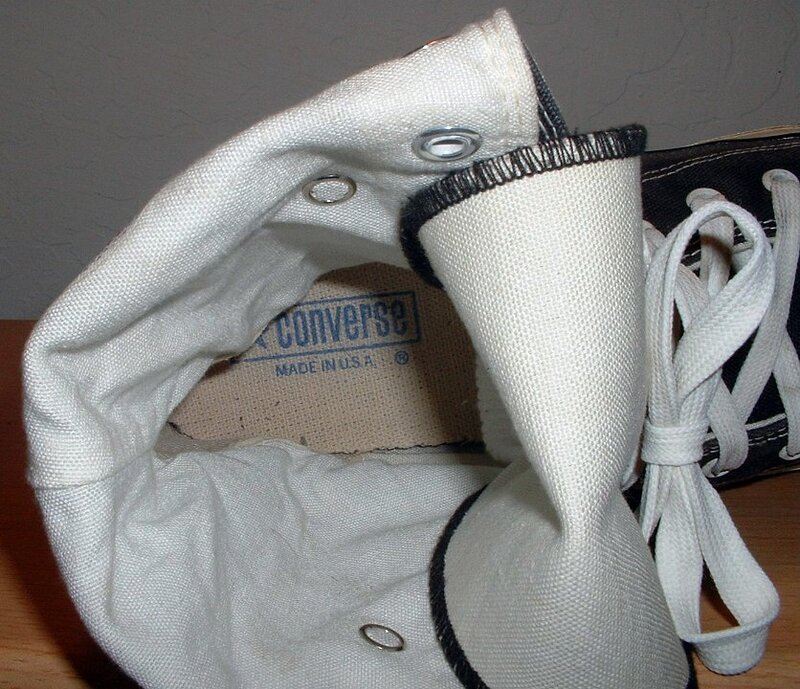 42 Knee High Chucks Walking in folded down black knee highs, front view. 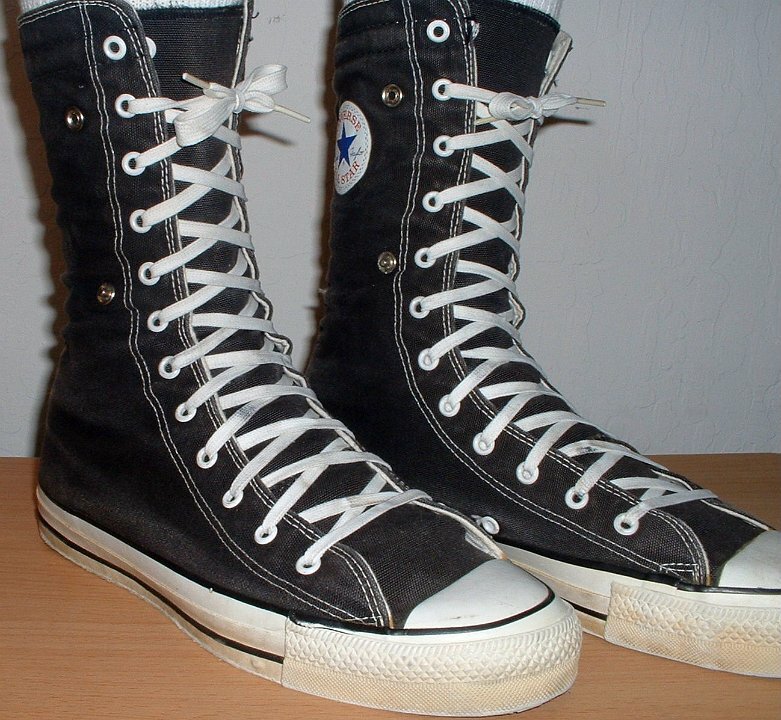 43 Knee High Chucks Wearing folded down black high tops, front view. 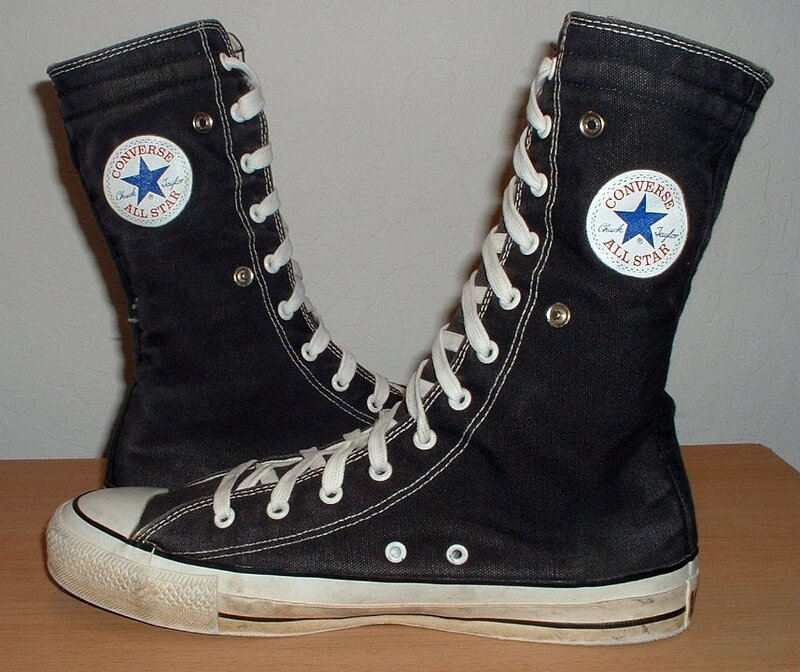 44 Knee High Chucks Wearing folded down black knee highs, angled side view. 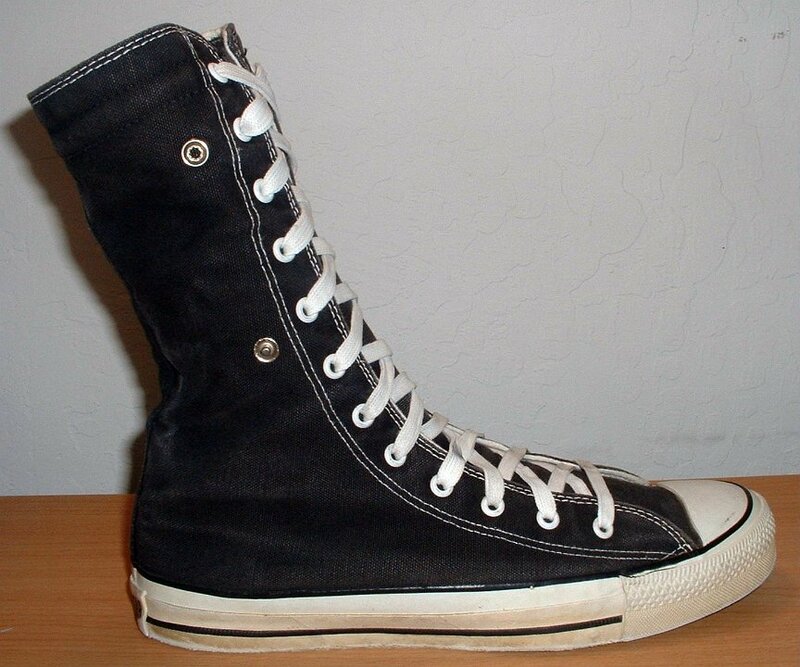 45 Knee High Chucks Walking in folded down black knee highs, side view. 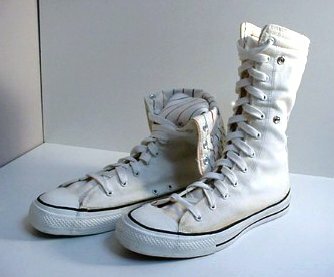 46 Knee High Chucks Wearing folded down black knee highs, rear view. 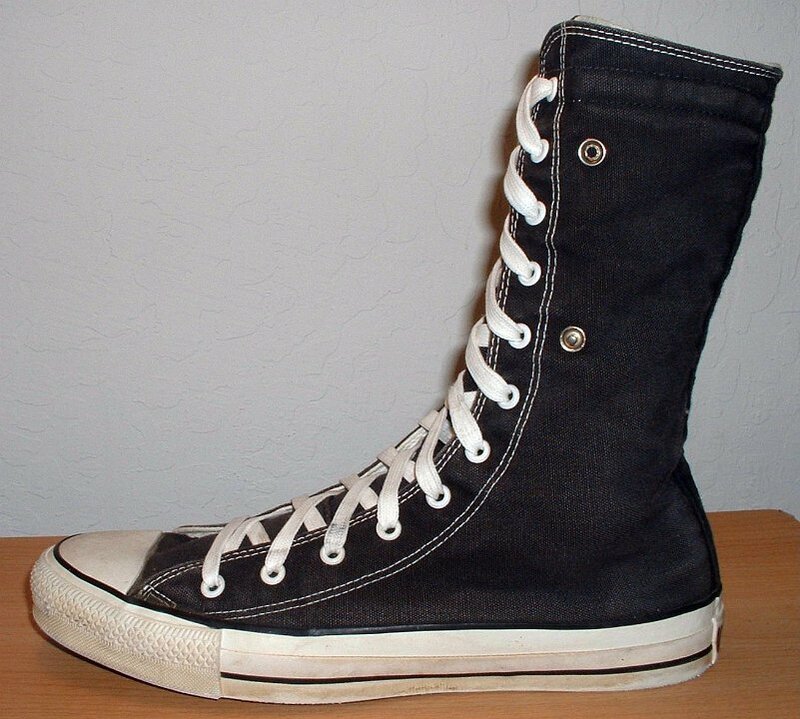 47 Knee High Chucks Walking in folded down black knee highs, rear view. 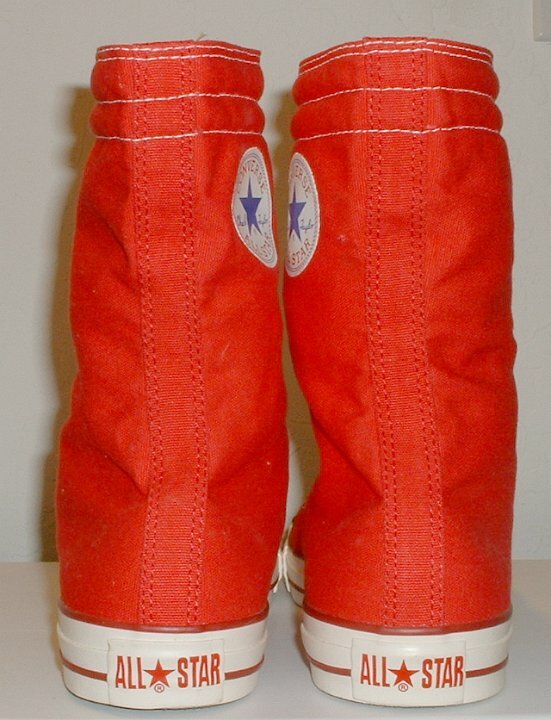 48 Knee High Chucks Wearing black knee highs with red piping, side view. 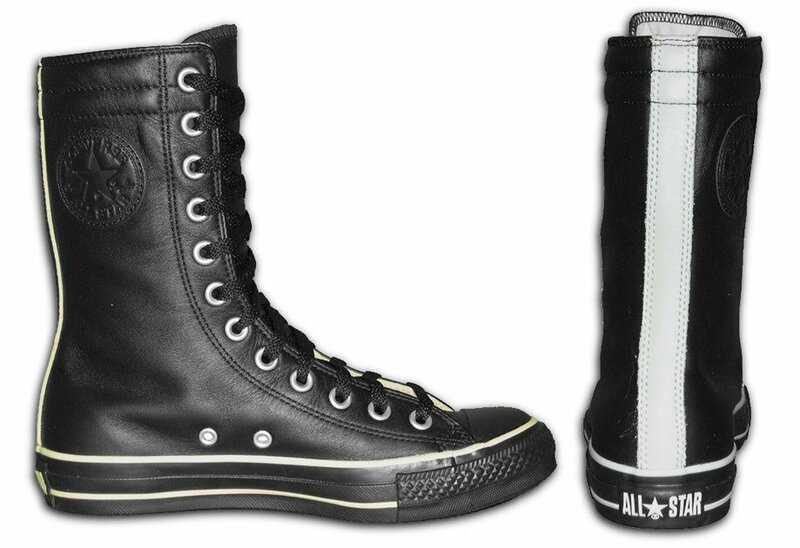 49 Knee High Chucks Black leather monochrome knee high with white trim, inside patch and rear views. 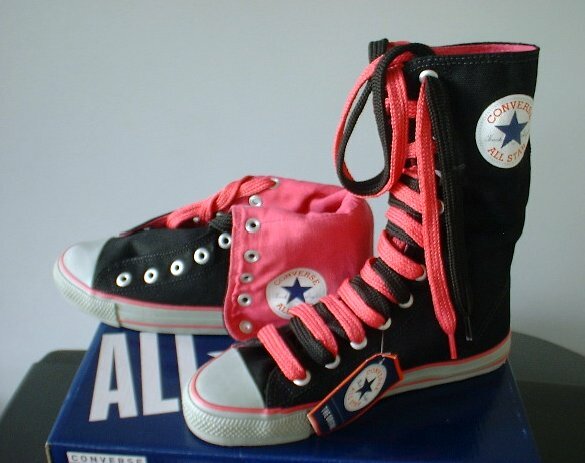 51 Knee High Chucks Black and neon pink knee highs, with wide black and neon pink laces. 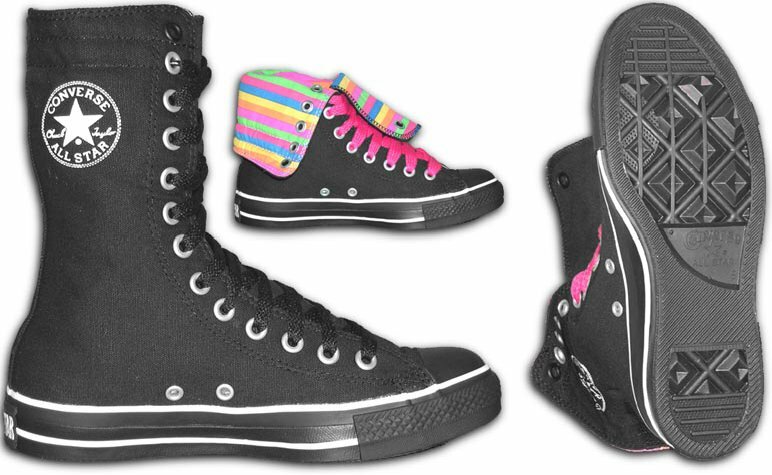 52 Knee High Chucks Black monochrome high with neon striped interior and white trim, inside patch, folded down interior, and sole views. 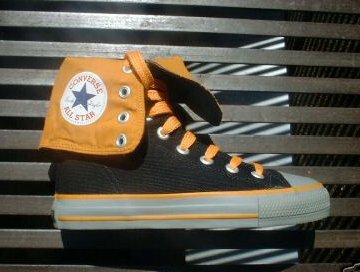 53 Knee High Chucks Left black and orange knee high, folded down side view. 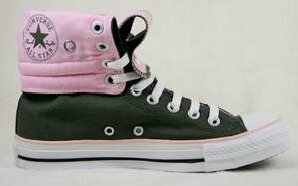 54 Knee High Chucks Inside patch view of a left black knee high with pink trim. 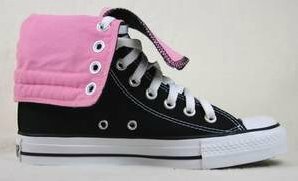 55 Knee High Chucks Outside view of a right black and pink kneehi folded down. 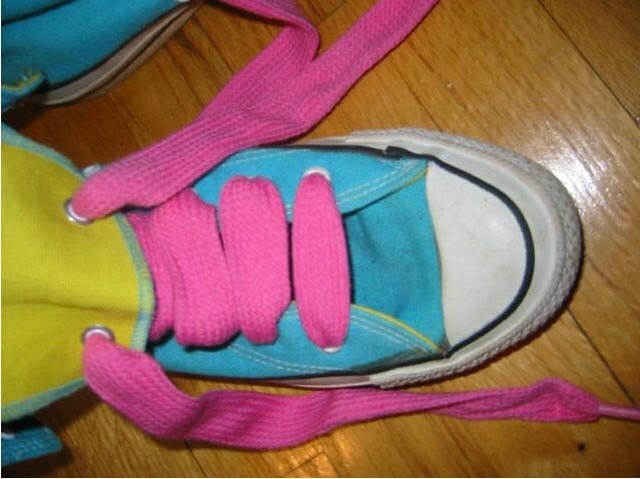 56 Knee High Chucks Inside patch view of a left black and pink kneehi, folded down. 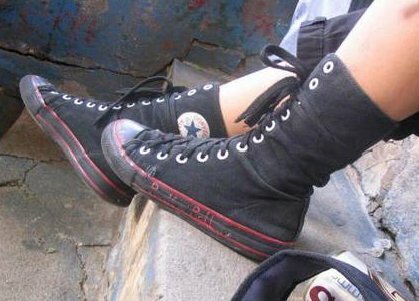 57 Knee High Chucks Wearing black monochrome knee highs, with red trim. 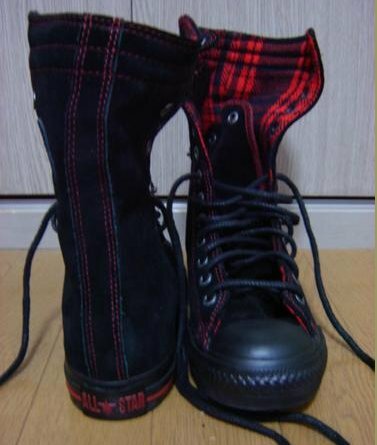 58 Knee High Chucks Black monochrome knee high with red plaid interior, front and rear views. 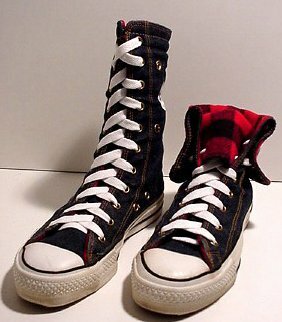 59 Knee High Chucks Black knee high with red plaid interior, angled front views. 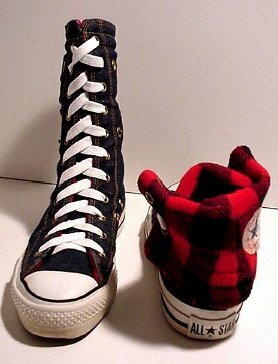 60 Knee High Chucks Black knee highs with red plaid interior, front view and folded down rear view. 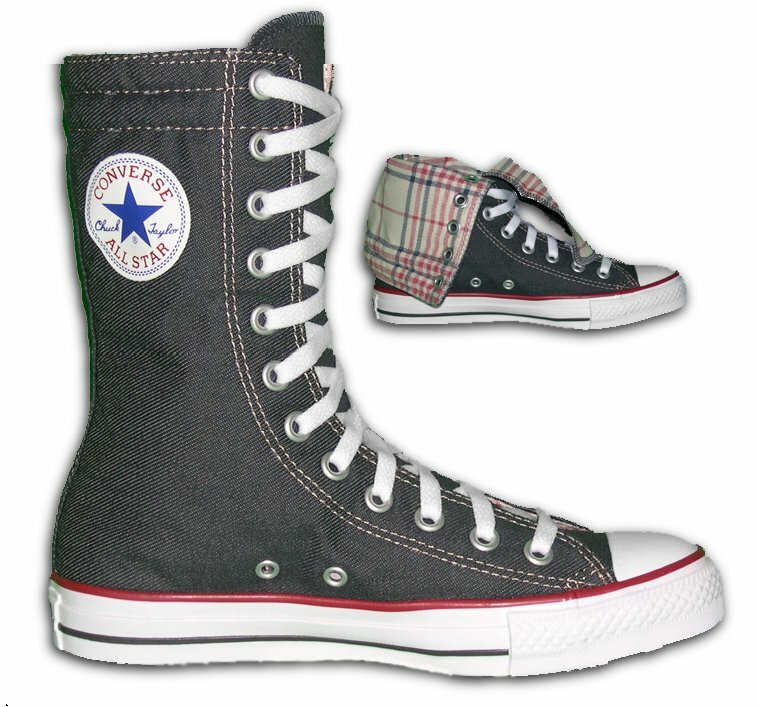 61 Knee High Chucks Black knee highs with red plaid interior, inside patch and sole views. 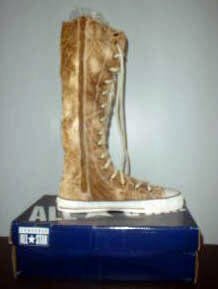 62 Knee High Chucks Exiting a truck wearing black knee hi boots. 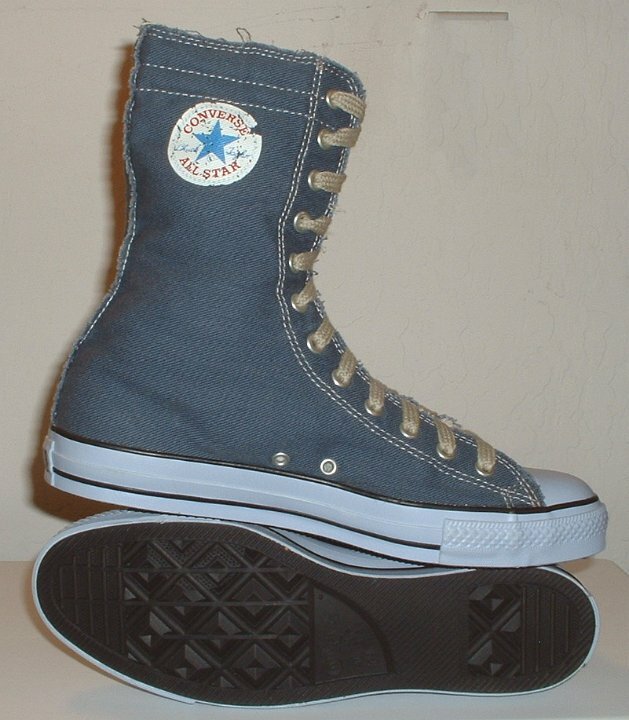 63 Knee High Chucks Catalog photo of a blue denim knee high with hemp laces, inside patch and sole views. 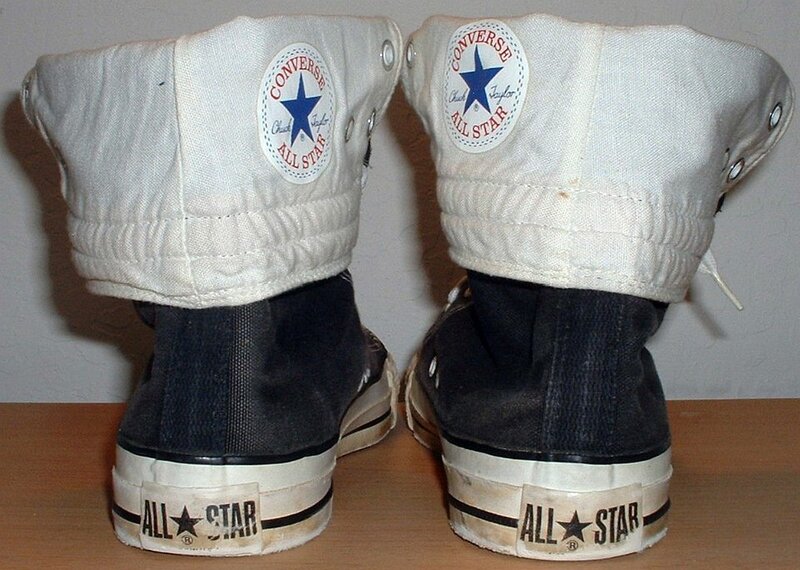 64 Knee High Chucks Inside patch view of a left blue denim knee high with hemp shoelaces. 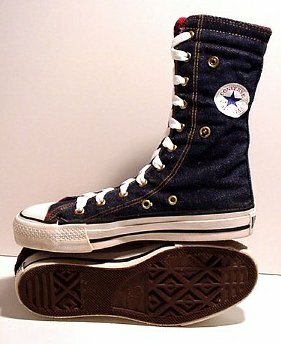 65 Knee High Chucks Outside view of a left blue denim knee high with hemp shoelaces. 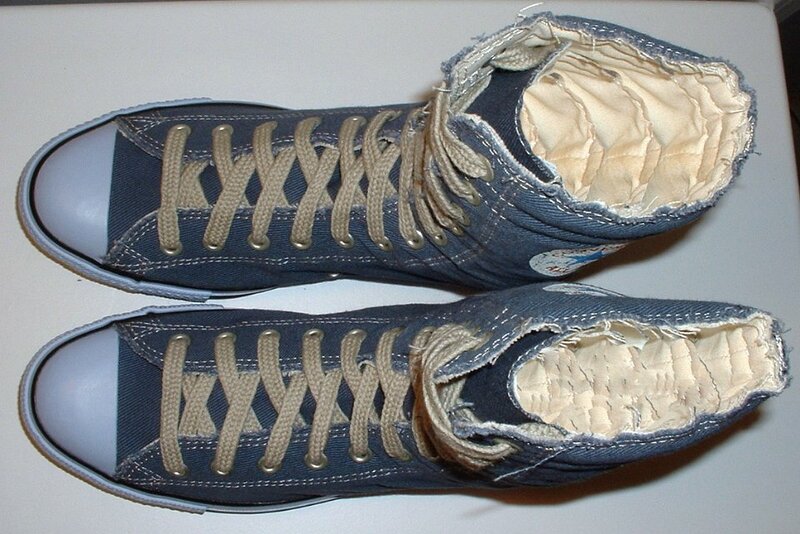 66 Knee High Chucks Inside patch view of a right blue denim knee high, with hemp shoelaces. 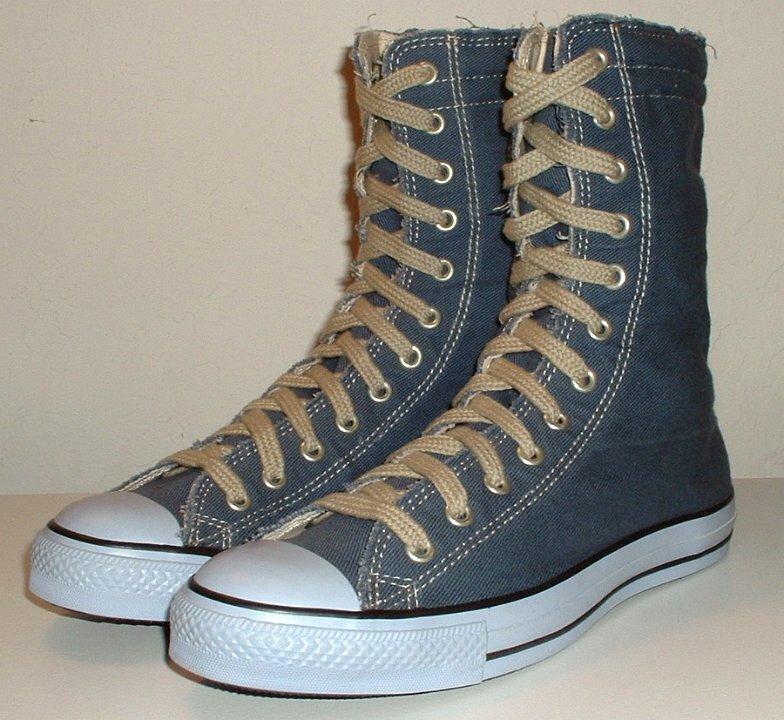 67 Knee High Chucks Outside view of a right blue denim knee high, with hemp shoelaces. 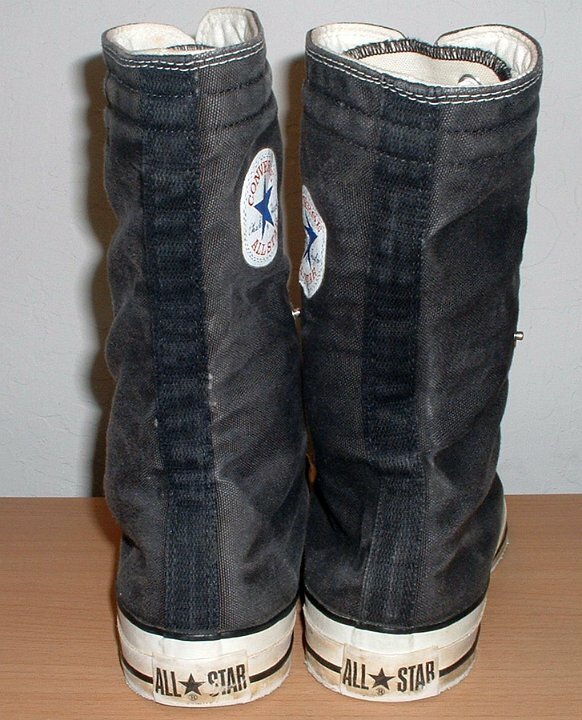 68 Knee High Chucks Rear view of blue denim knee highs. 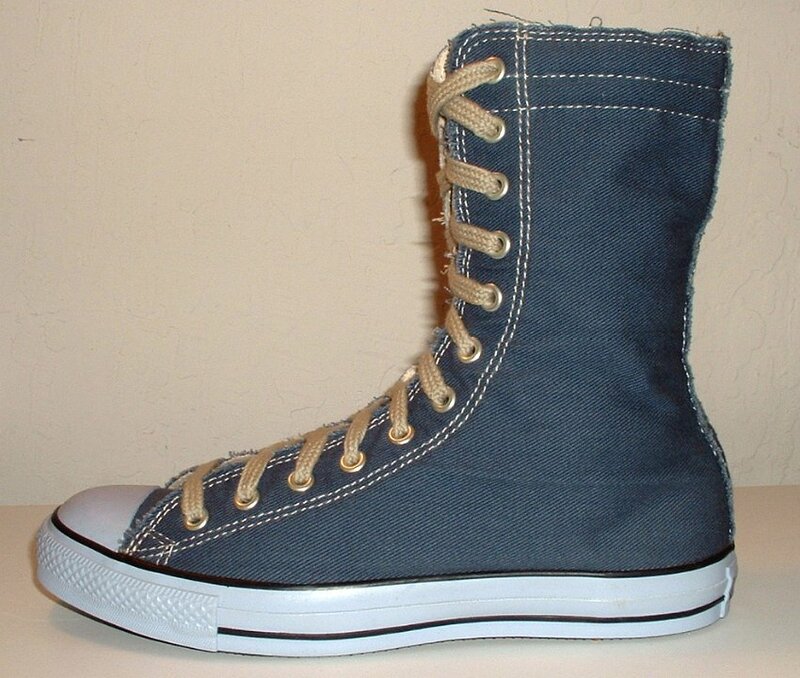 69 Knee High Chucks Angled side view of blue denim knee highs with hemp shoelaces. 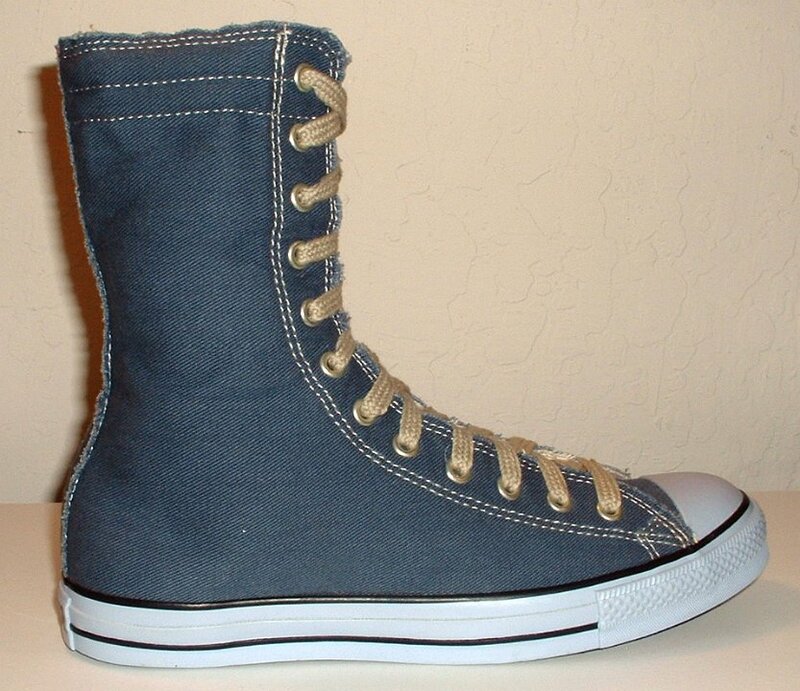 70 Knee High Chucks Front view of blue denim knee highs with hemp shoelaces. 71 Knee High Chucks Top view of blue denim knee highs with hemp shoelaces. 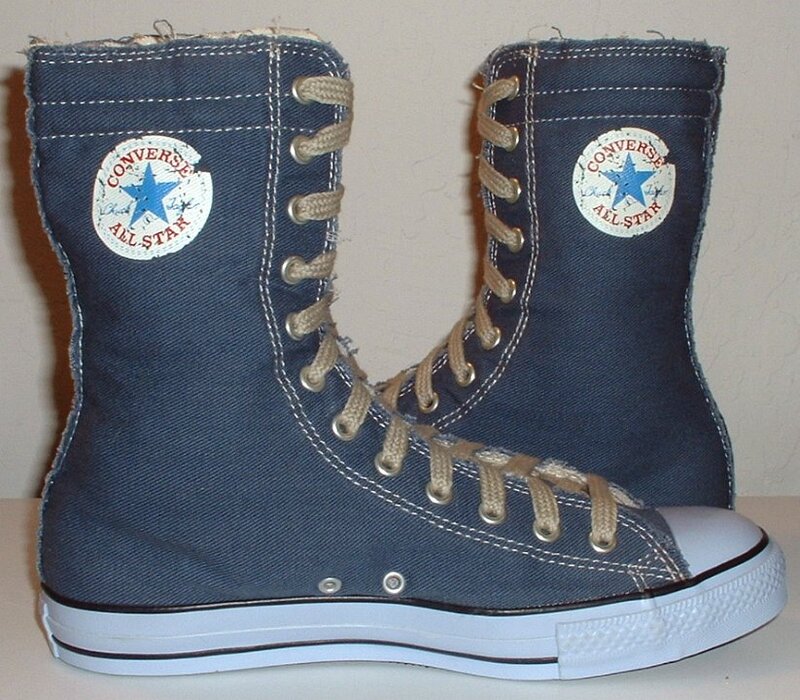 72 Knee High Chucks Inside patch views of blue denim knee highs with hemp shoelaces. 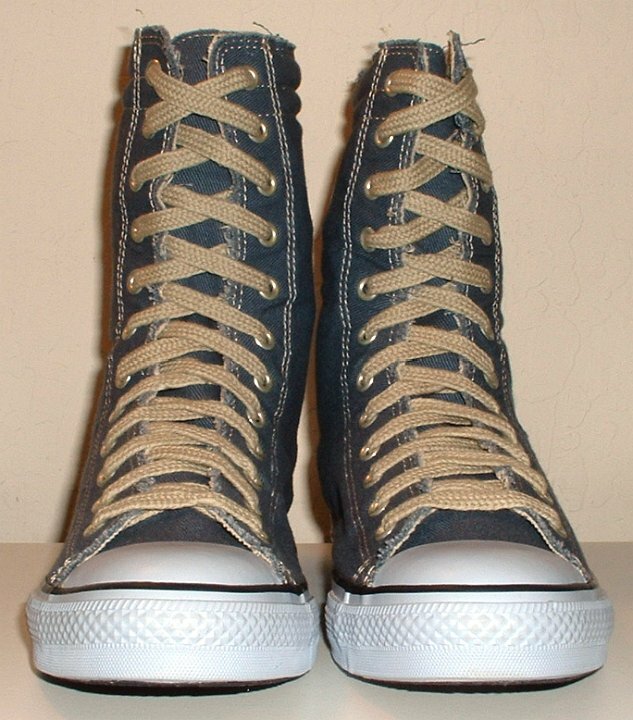 73 Knee High Chucks Angled front view of blue denim knee high chucks with hemp shoelaces. 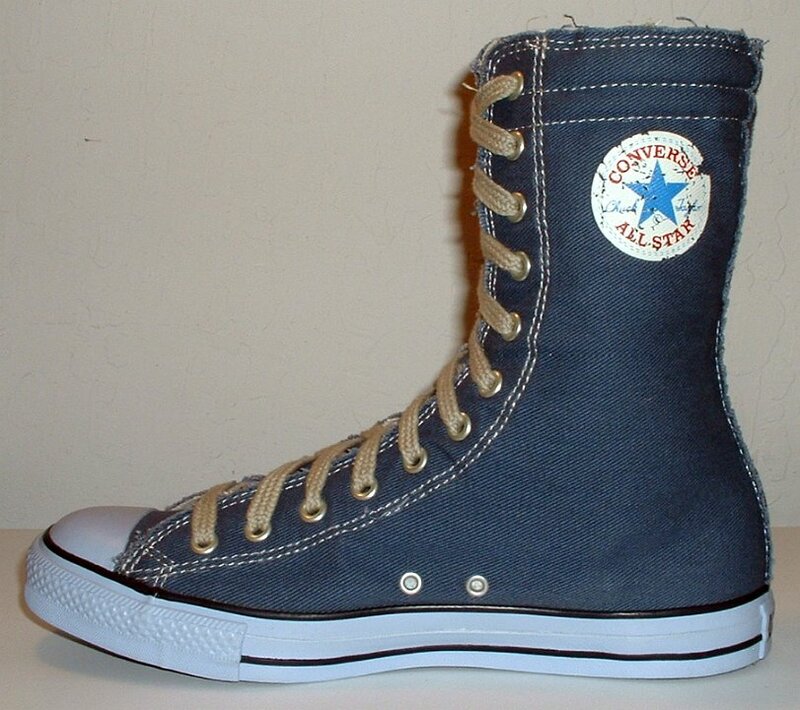 74 Knee High Chucks Inside patch and sole views of blue denim knee highs with hemp shoelaces. 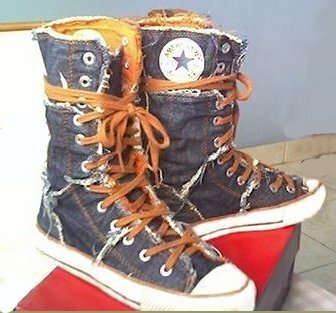 75 Knee High Chucks Dark blue denim extra high with plaid interior and red and white trim, inside patch and folded down interior views. 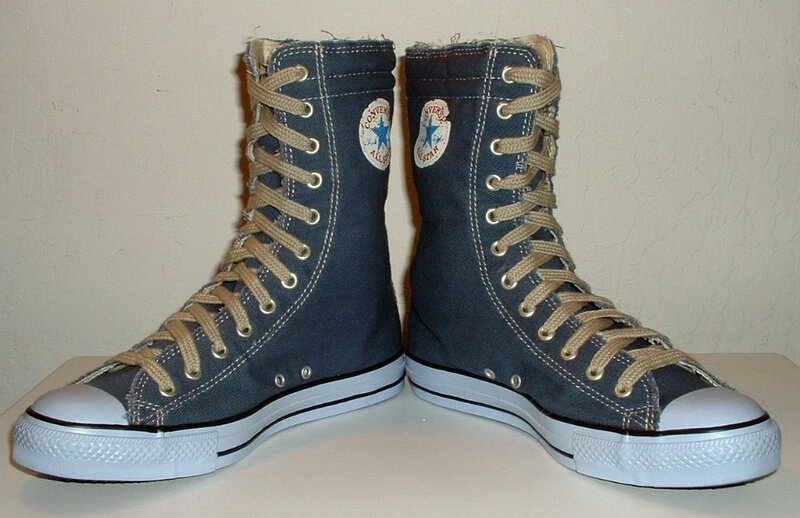 76 Knee High Chucks Blue denim and light brown knee highs with light brown shoelaces, angled side views. 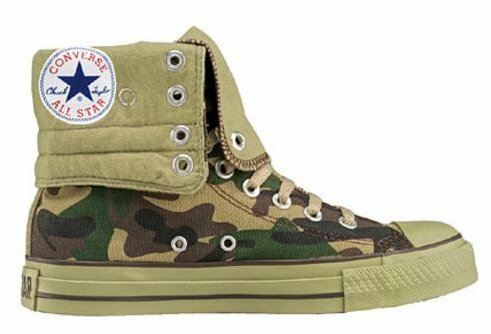 77 Knee High Chucks Left camouflage knee high, folded down inside patch view. 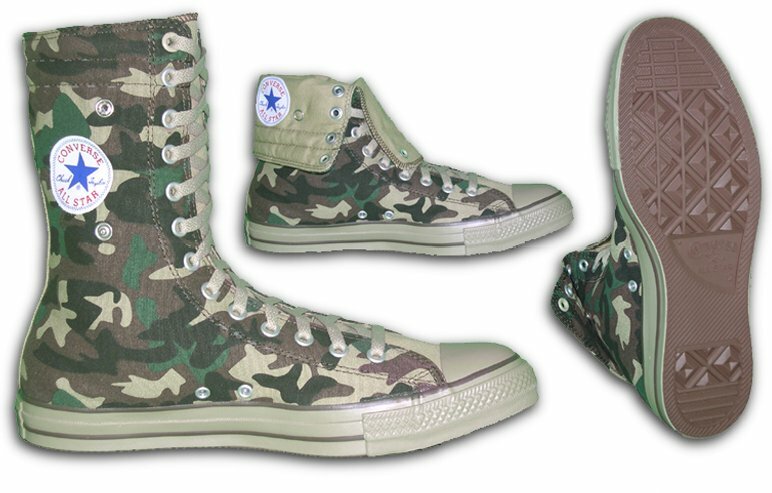 78 Knee High Chucks Camouflage knee high with army green interior, inside patch, folded down interior patch, and sole views. 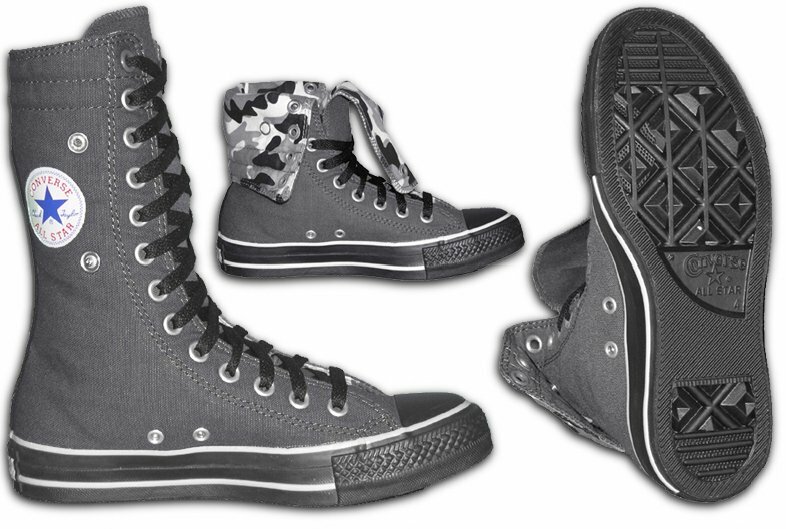 79 Knee High Chucks Charcoal and black knee high with white trim and grey camouflage interior, inside patch, folded down interior, and sole views. 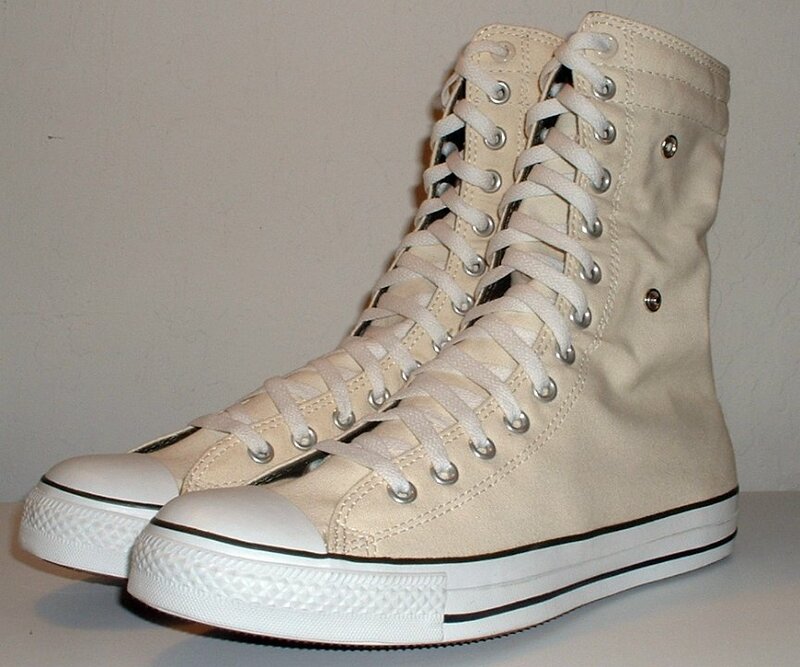 80 Knee High Chucks Chocolate brown monochrome knee high, outside folded down view. 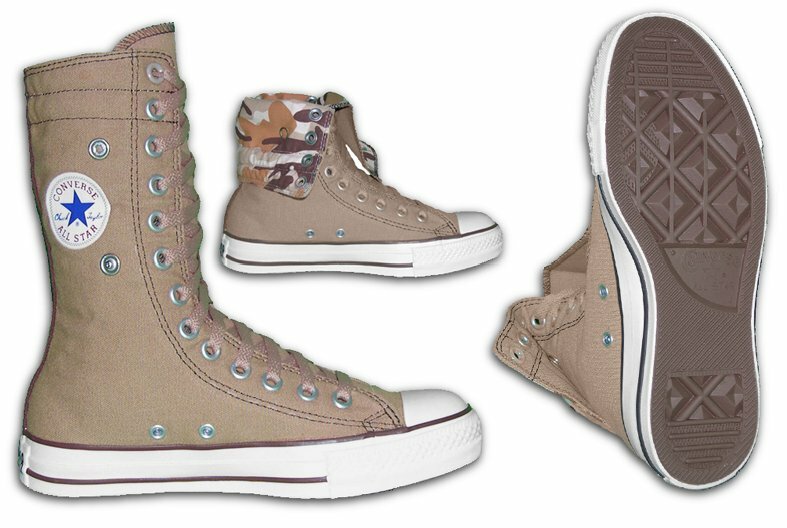 81 Knee High Chucks Dark khaki with brown and white trim and brown camouflage interior, inside patch, folded down interior patch, and sole views. 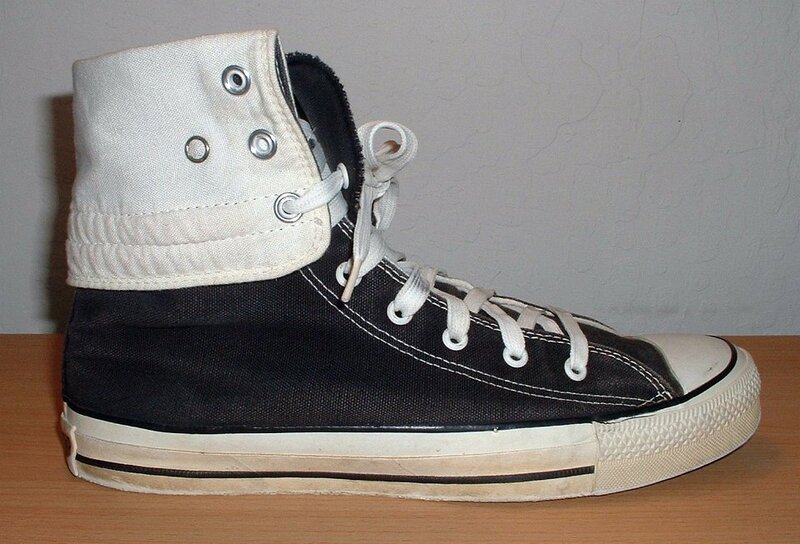 82 Knee High Chucks Euro black knne highs, side view of a brand new pair folded down. 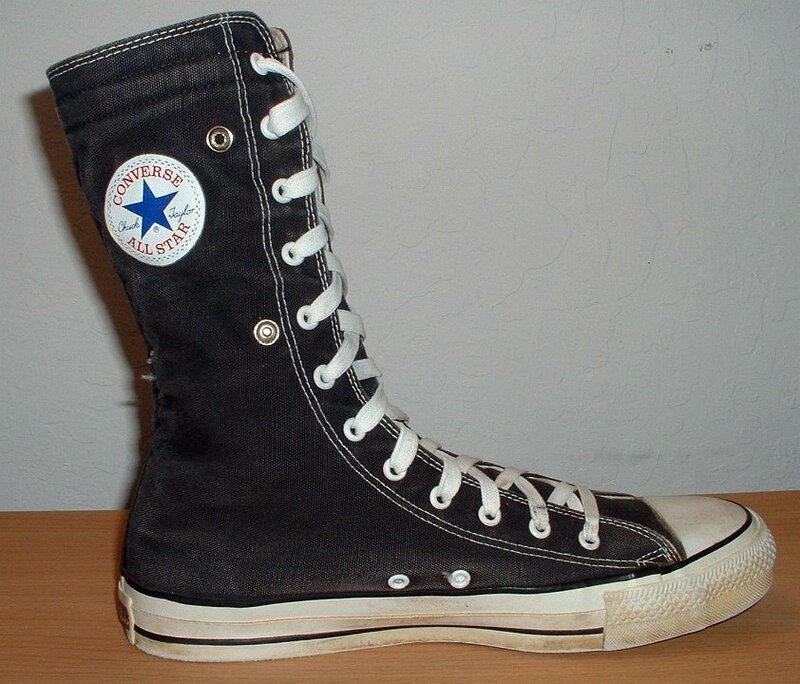 83 Knee High Chucks Angled side view of a left euro black knee high. 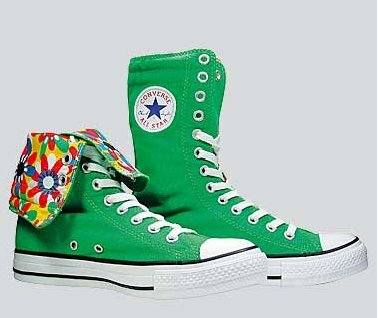 84 Knee High Chucks Angled side view of green and multicolored pattern knee highs. 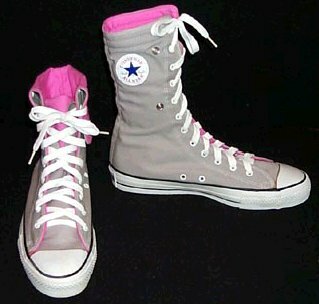 85 Knee High Chucks Grey and pink knee highs, front view and folded down side view. 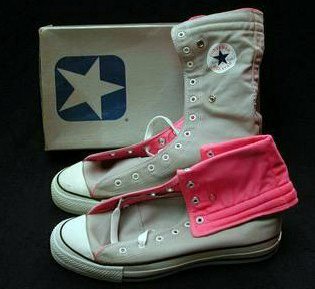 86 Knee High Chucks Grey and pink knee highs, left inside patch view and folded down right front view. 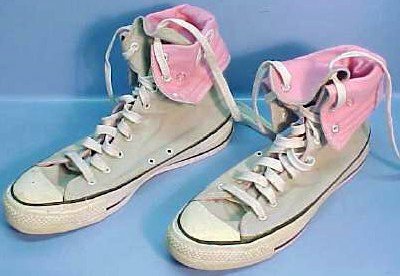 87 Knee High Chucks Grey and pink knee highs, folded down angled side views. 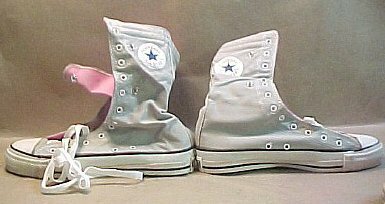 88 Knee High Chucks Brand new vintage grey and pink knee highs, right inside patch view and folded down left side view. 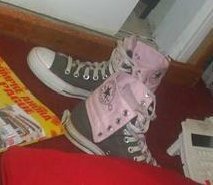 89 Knee High Chucks Wearing grey and pink knee highs, side views. 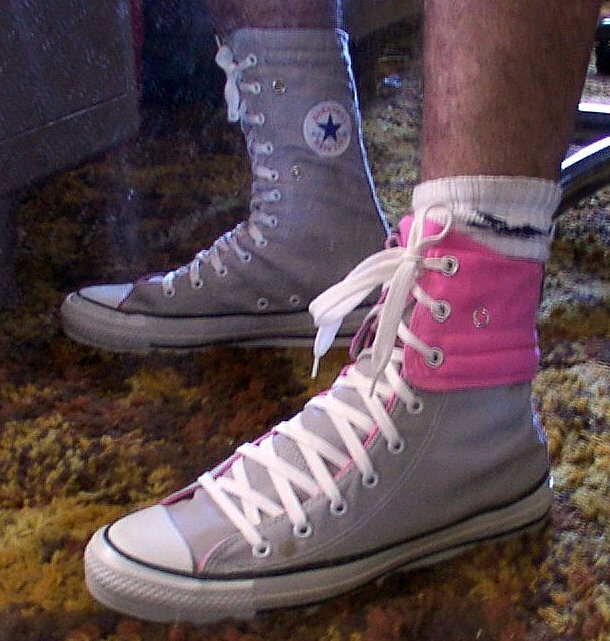 90 Knee High Chucks Folded down grey and pink knee highs, side view. 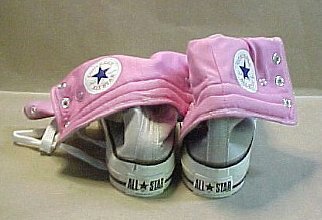 91 Knee High Chucks Grey and pink knee highs, left side view and folded down right inside patch view. 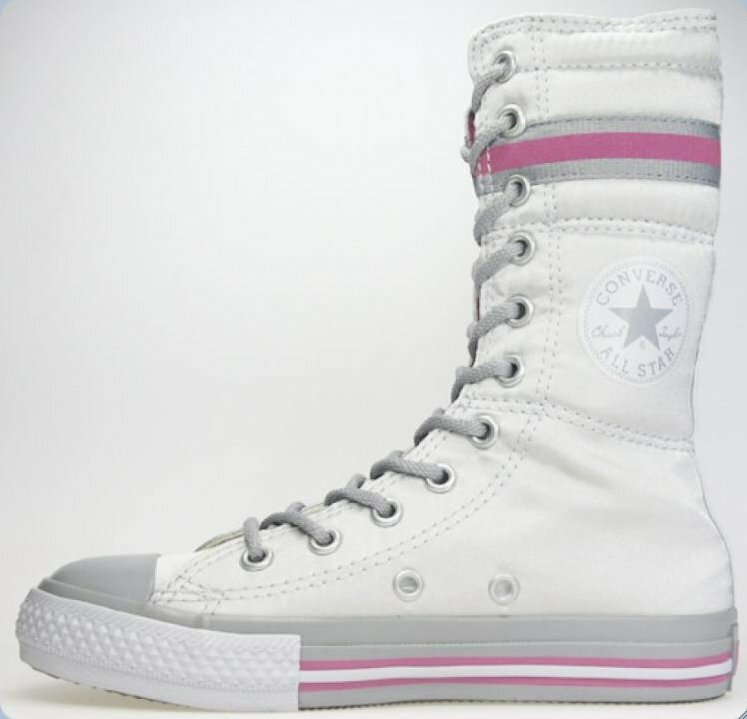 92 Knee High Chucks Brand new grey and pink knee highs, inside patch views. 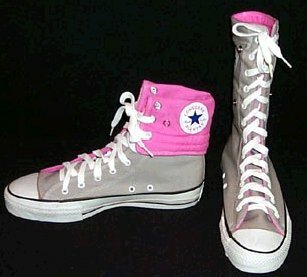 93 Knee High Chucks Brand new grey and pink knee highs, folded down rear view. 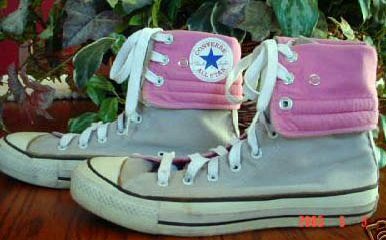 94 Knee High Chucks Grey and pink knee highs, folded down angled side views. 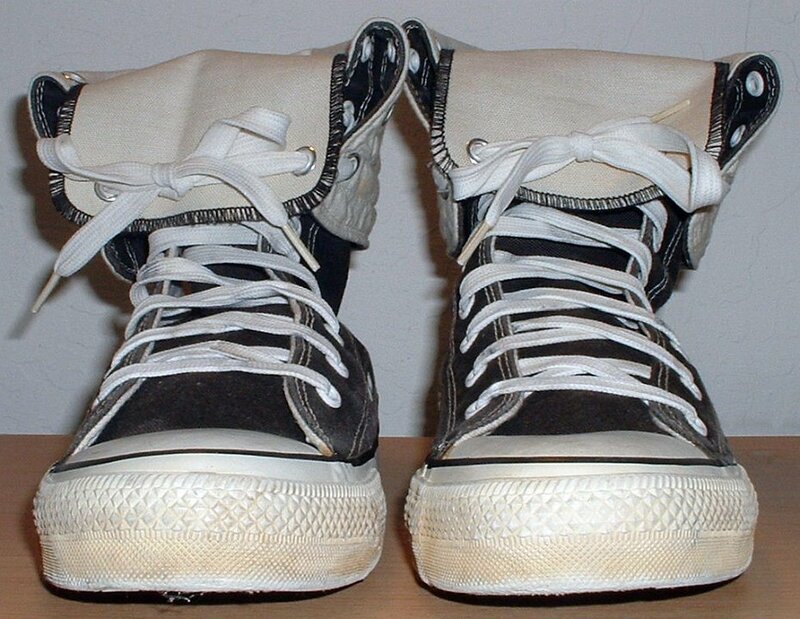 95 Knee High Chucks Lacing up a left grey knee high. 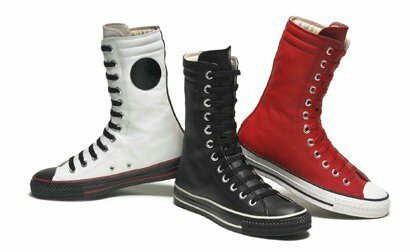 96 Knee High Chucks Leather knee highs in white/black, black/white, and red/white. 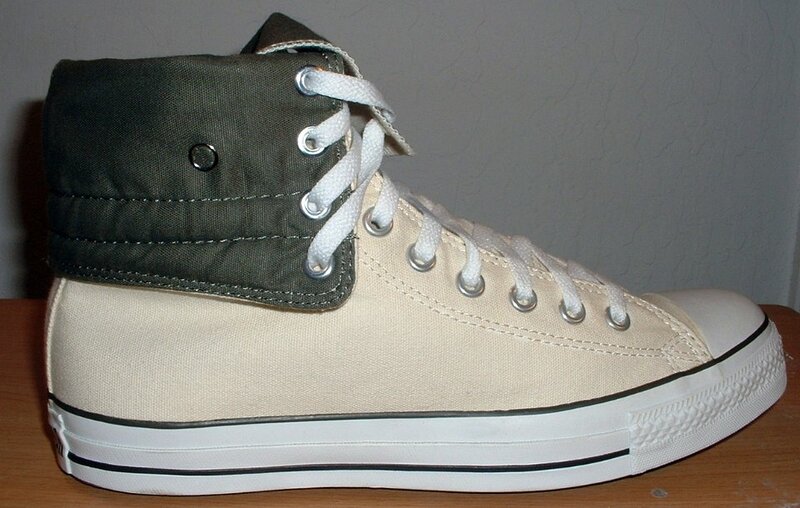 97 Knee High Chucks Khaki suede knee high with parchment interior, inside patch, folded down interior, and sole views. 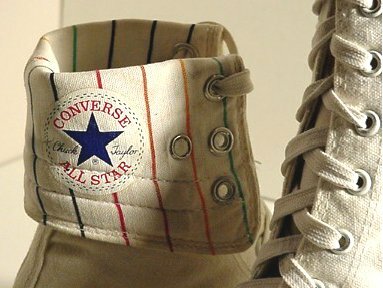 98 Knee High Chucks Collage of knee highs in various color combinations. 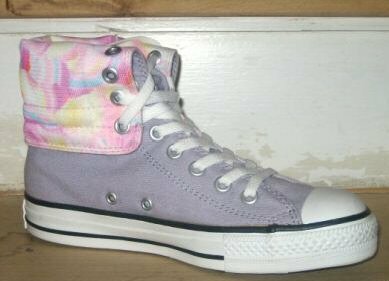 99 Knee High Chucks Inside patch view of a right lavender and pink plaid knee high. 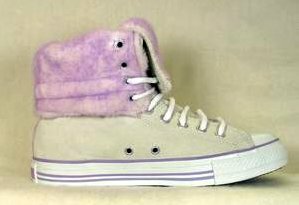 100 Knee High Chucks Angled outside view of a right lavender and pink plaid knee high, folded down. 101 Knee High Chucks Inside patch view of a left leopard pattern knee high. 102 Knee High Chucks Side view of leopard pattern knee highs. 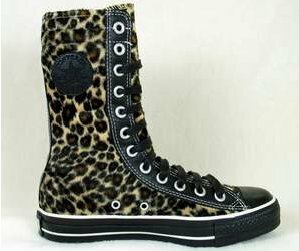 103 Knee High Chucks Side view of leopard pattern knee highs. 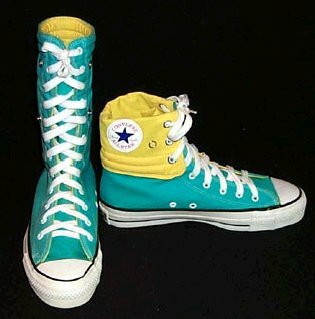 104 Knee High Chucks Light blue and yellow knee highs, rear view. 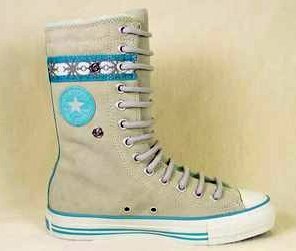 105 Knee High Chucks Light blue and yellow knee highs, side view. 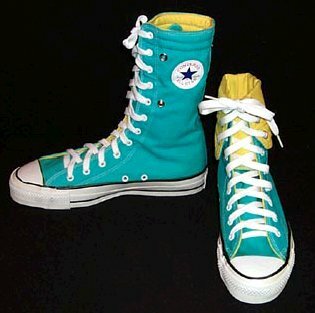 106 Knee High Chucks Light blue and yellow folded down knee highs, angled side view. 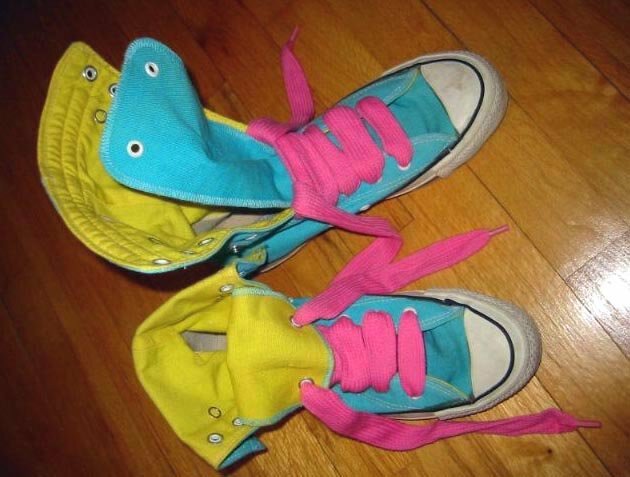 107 Knee High Chucks Light blue and yellow knee highs with wide pink laces, top and angled side views. 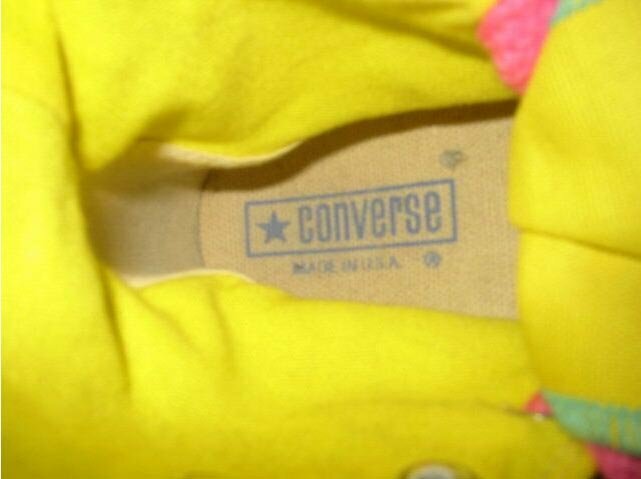 108 Knee High Chucks Inner sole view of light blue and yellow knee high. 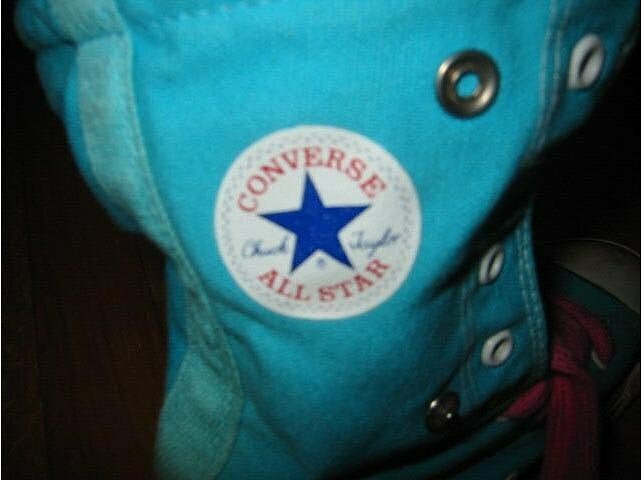 109 Knee High Chucks Closeup of an outside patch on a light blue and yellow knee high. 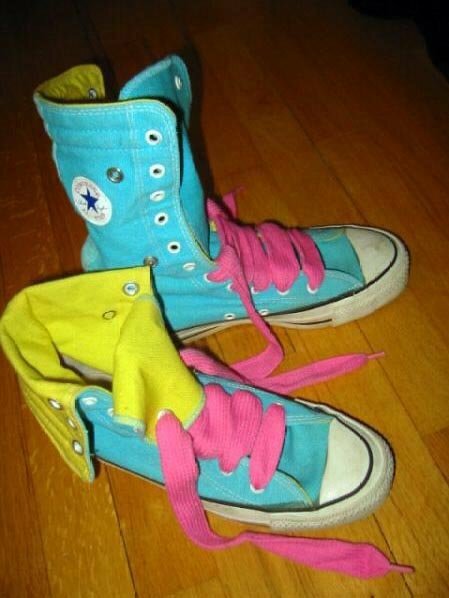 110 Knee High Chucks Top view of a light blue and yellow right knee high with wide pink laces. 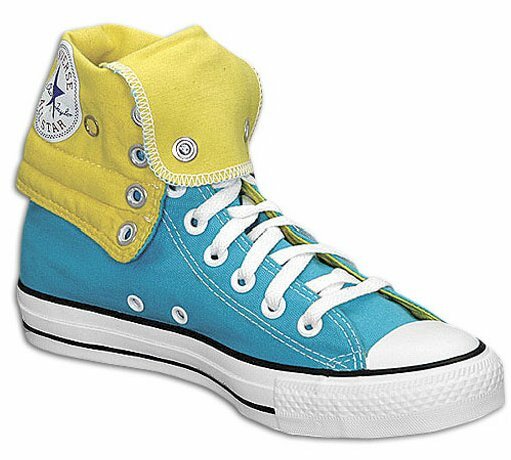 111 Knee High Chucks Angled top view of light blue and yellow knee highs. 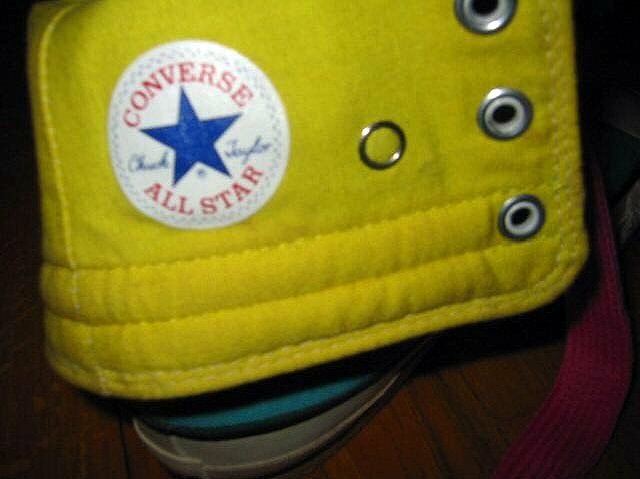 112 Knee High Chucks Close up of a folded down inside patch on a light blue and yellow knee high. 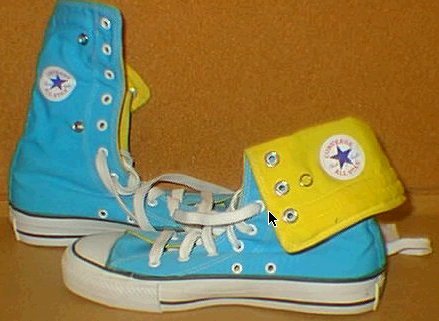 113 Knee High Chucks Light blue and yellow knee highs, right front view and left folded down side view. 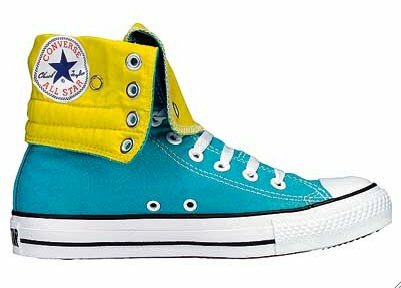 114 Knee High Chucks Light blue and yellow knee highs, right inside patch view and left folded down front view. 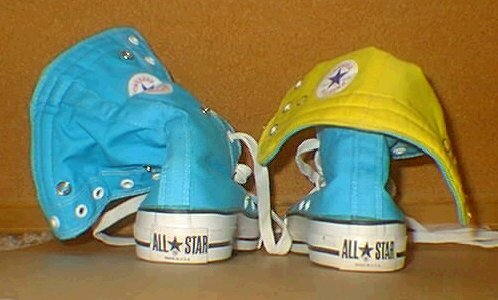 115 Knee High Chucks Catalog photo of a folded down left light blue and yellow knee high. 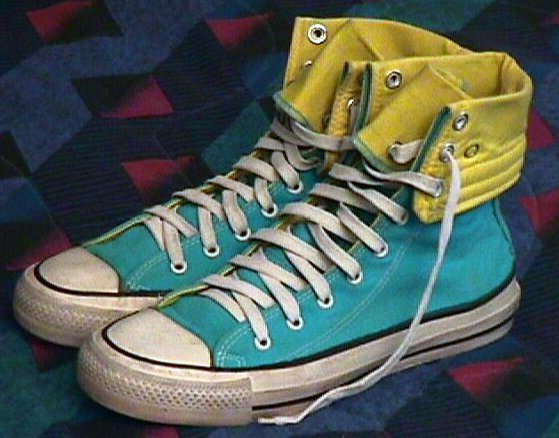 116 Knee High Chucks Inside patch view of a left light blue and yellow knee high, folded down. 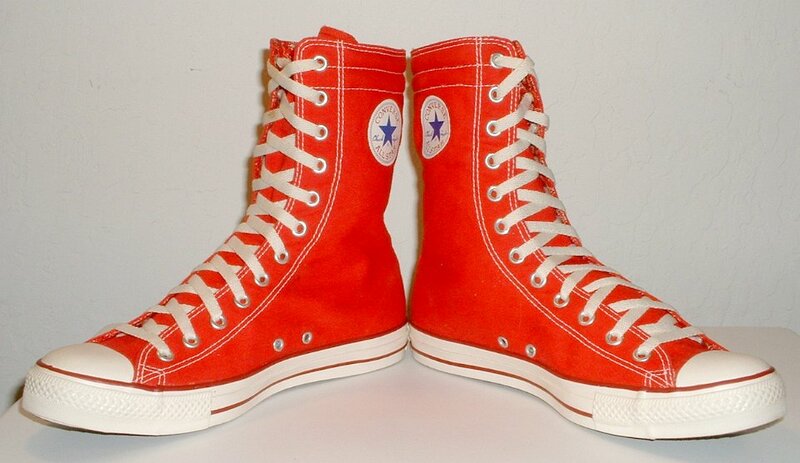 117 Knee High Chucks Multicultural knee high in parchment, red, and orange, inside patch view. 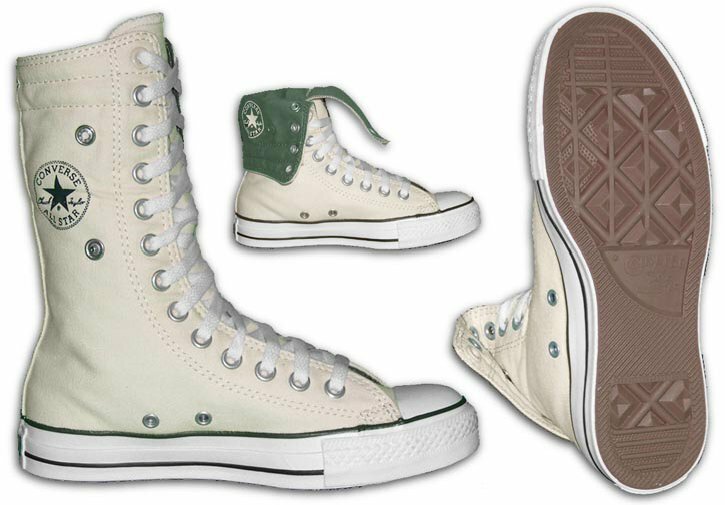 118 Knee High Chucks Off white and green knee highs, full height inside patch, folded down interior patch, and sole views. 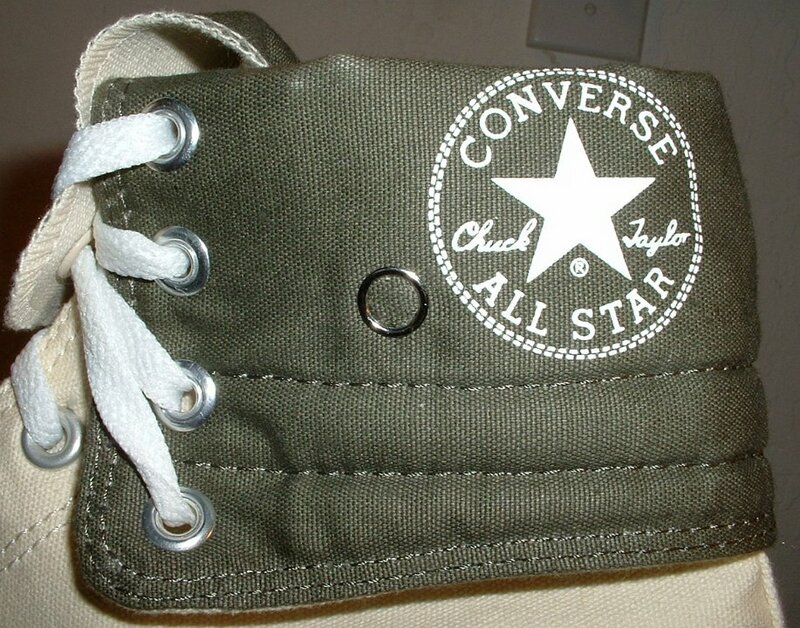 119 Knee High Chucks Inside patch view of a left olive monochrome knee high. 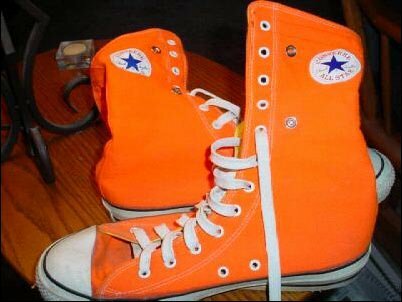 120 Knee High Chucks Inside patch views of orange knee highs. 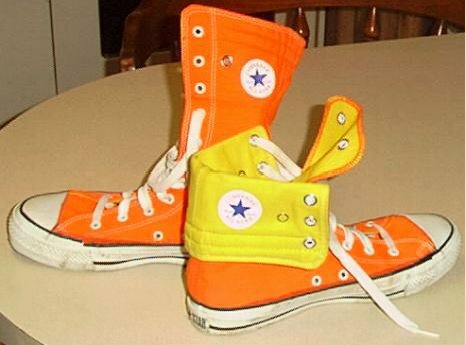 121 Knee High Chucks Orange and yellow knee highs in side views. 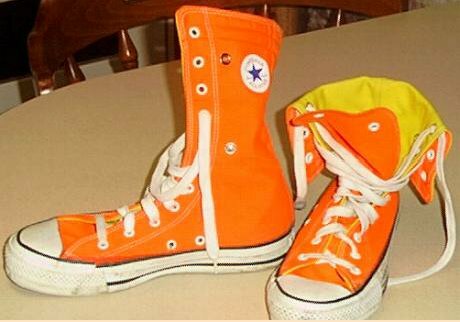 122 Knee High Chucks Orange and yellow knee highs, angled side and front views. 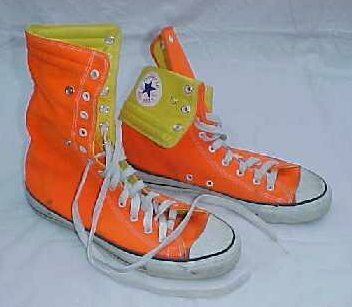 123 Knee High Chucks Orange and yellow knee highs, folded down rear view. 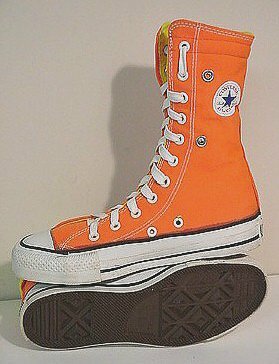 124 Knee High Chucks Orange and yellow knee highs, angled side views. 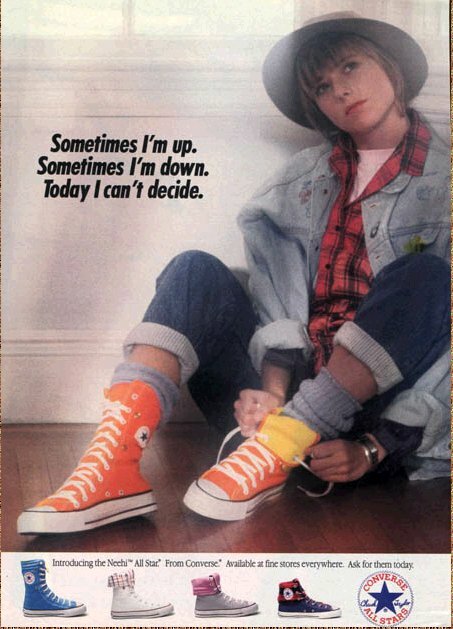 125 Knee High Chucks Converse ad for kneehi chucks. 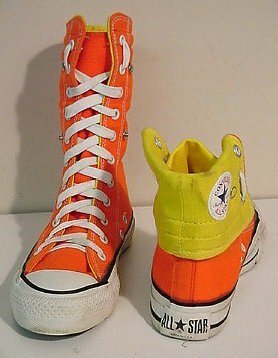 126 Knee High Chucks Orange and yellow knee highs, front view of right shoe full height and left shoe folded down. 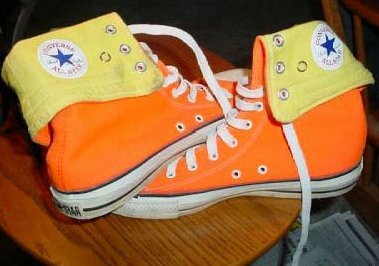 127 Knee High Chucks Orange and yellow knee highs, right front view and left folded down rear view. 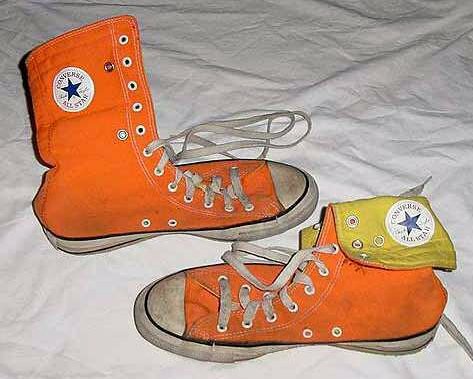 128 Knee High Chucks Orange and yellow knee highs, inside patch and sole views. 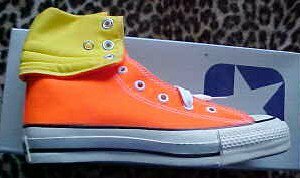 129 Knee High Chucks Brand new right orange and yellow knee high, folded down inside patch view. 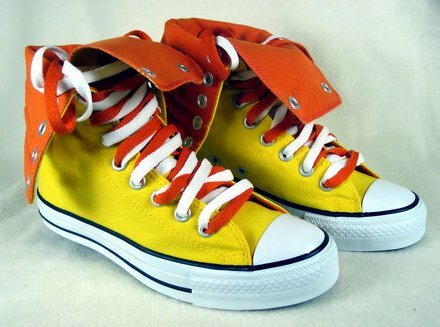 130 Knee High Chucks Brand new right orange and yellow knee high, folded down outside view. 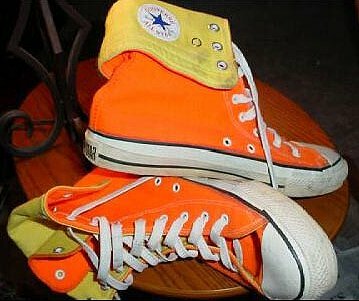 131 Knee High Chucks Well worn orange and yellow knee highs, top view. 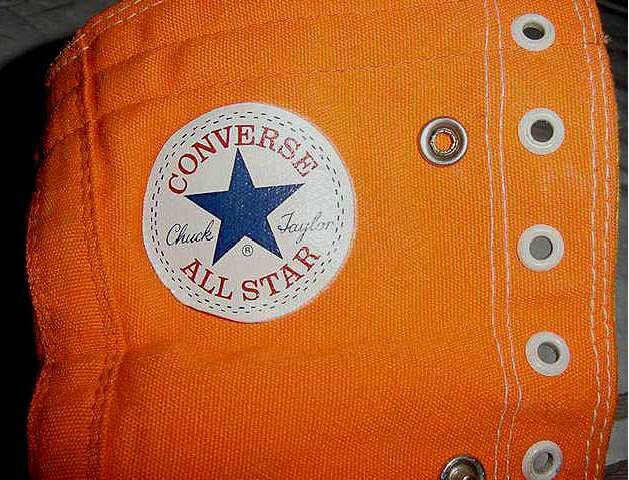 132 Knee High Chucks Closeup of the outer side patch and snaps on an orange knee high. 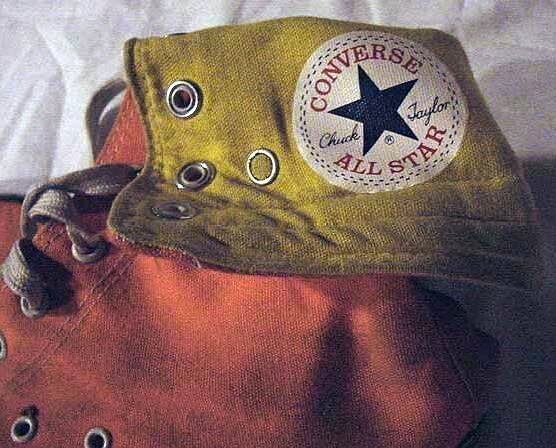 133 Knee High Chucks Closeup of the inside patch on a well worn orange and yellow knee high. 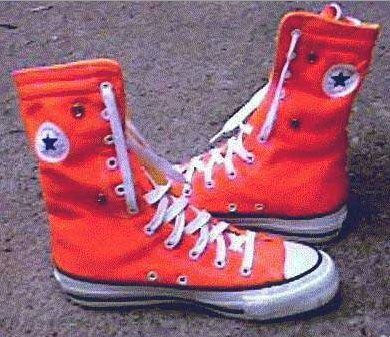 134 Knee High Chucks Orange knee highs, side view. 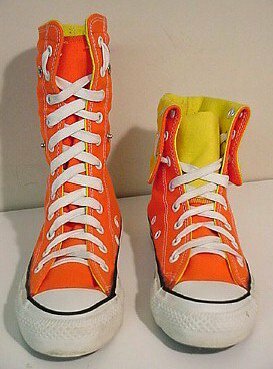 135 Knee High Chucks Folded down orange and yellow knee highs, angled side views. 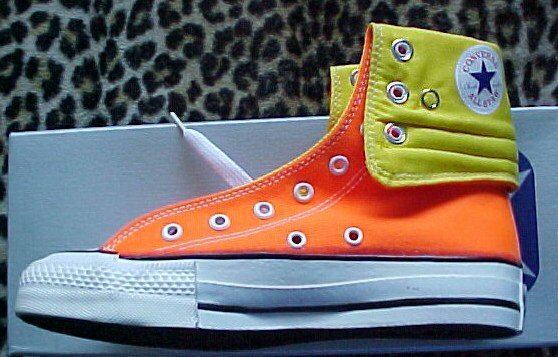 136 Knee High Chucks Folded down orange and yellow knee highs, angled inside patch views. 137 Knee High Chucks Inside patch view of a left parchment and green knee high, folded down. 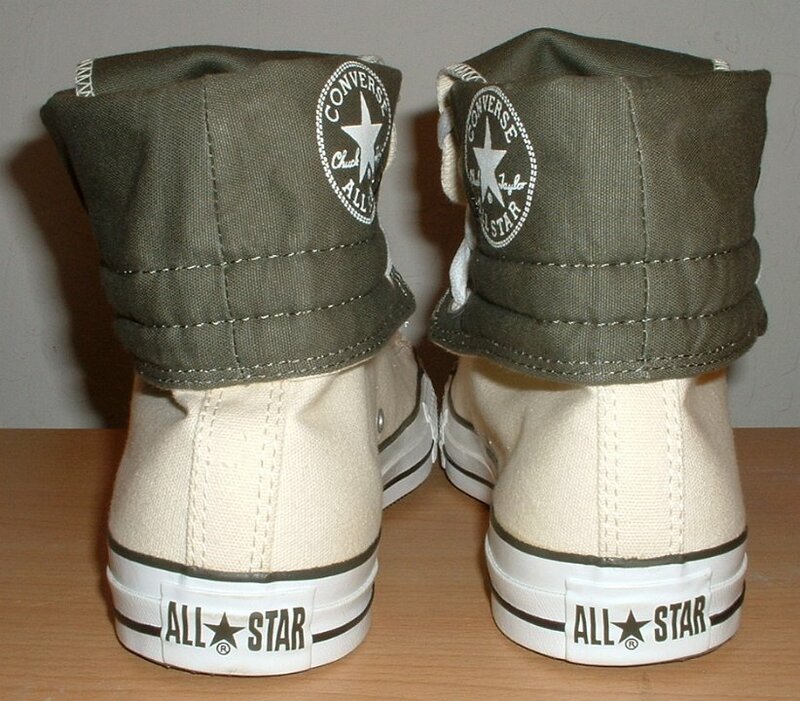 138 Knee High Chucks Outside view of a left parchment and olive knee high, folded down. 139 Knee High Chucks Inside patch view of a right folded down parchment and olive knee high. 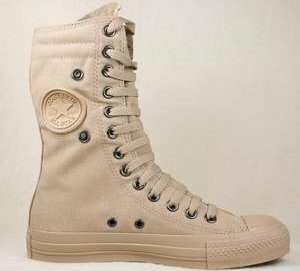 140 Knee High Chucks Outside view of a right folded down parchment and olive knee high. 141 Knee High Chucks Rear view of parchment and olive knee highs, folded down. 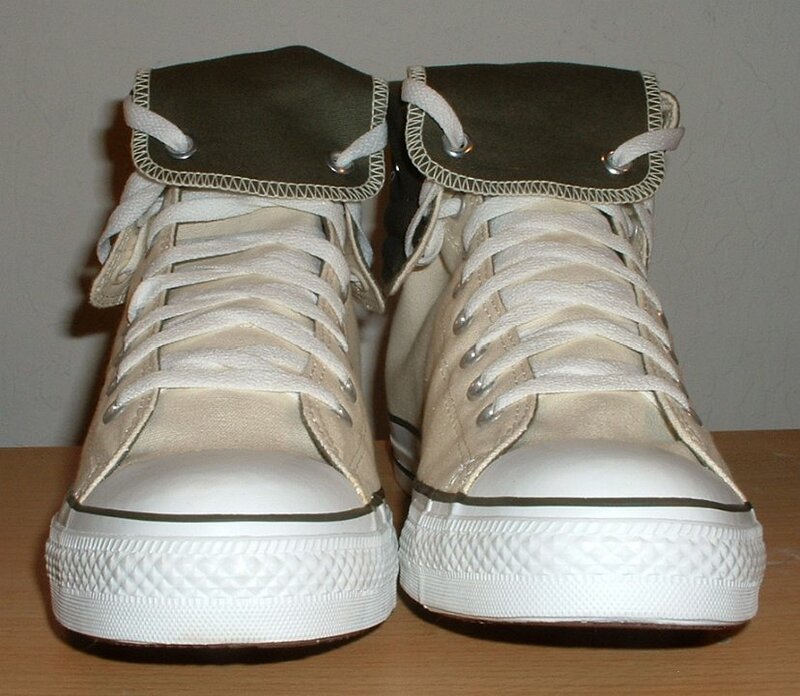 142 Knee High Chucks Front view of parchment and olive knee highs, folded down. 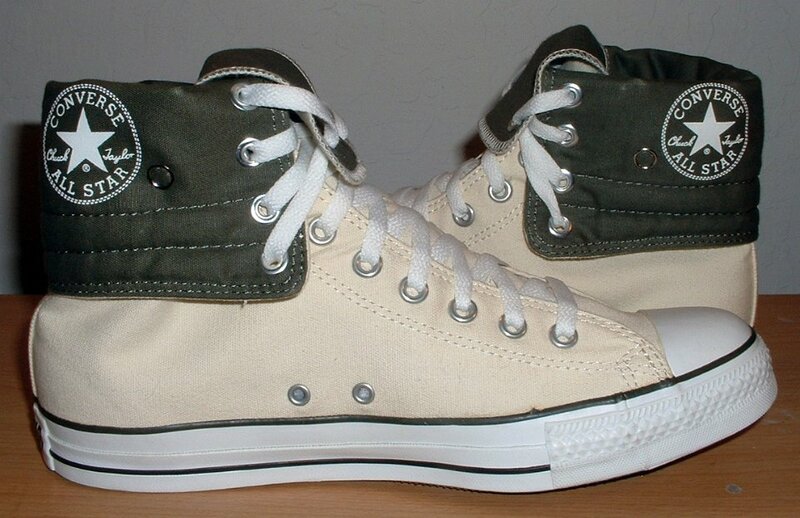 143 Knee High Chucks Top view of folded down parchment and olive knee highs. 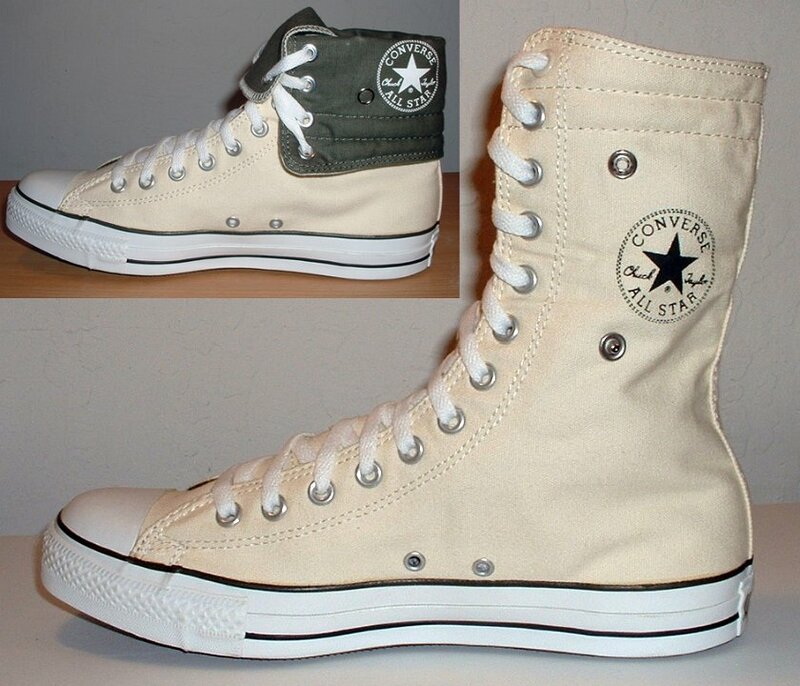 144 Knee High Chucks Inside patch views of rolled down parchment and olive knee highs. 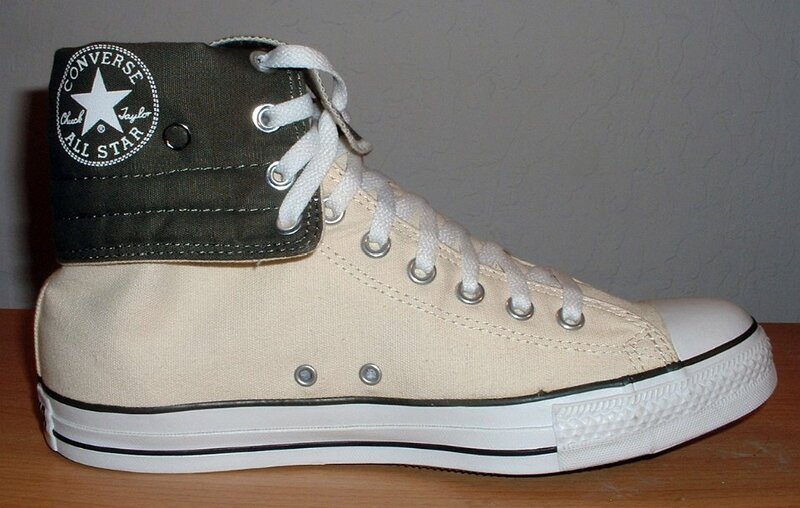 145 Knee High Chucks Inside patch and sole views of folded down parchment and olive knee highs. 146 Knee High Chucks Closeup of the inside patch on a right folded down parchment and olive knee high. 147 Knee High Chucks Outside view of a right parchment and olive knee high. 148 Knee High Chucks Inside patch view of a right parchment and olive knee high. 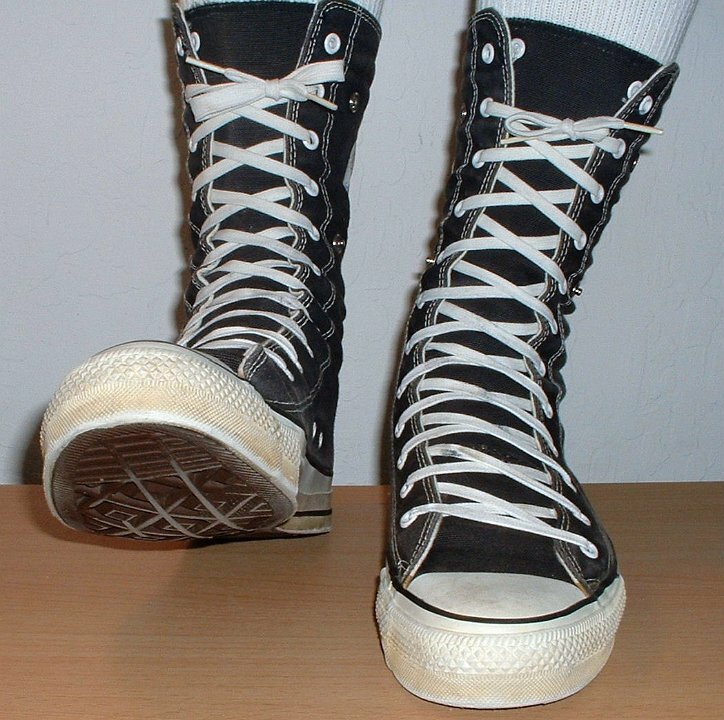 149 Knee High Chucks Outside view of a left parchment and olive knee high. 150 Knee High Chucks Inside patch view of a left parchment and olive knee high. 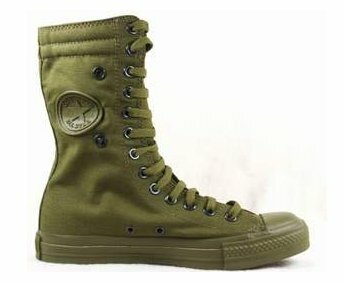 151 Knee High Chucks Front view of parchment and olive knee highs. 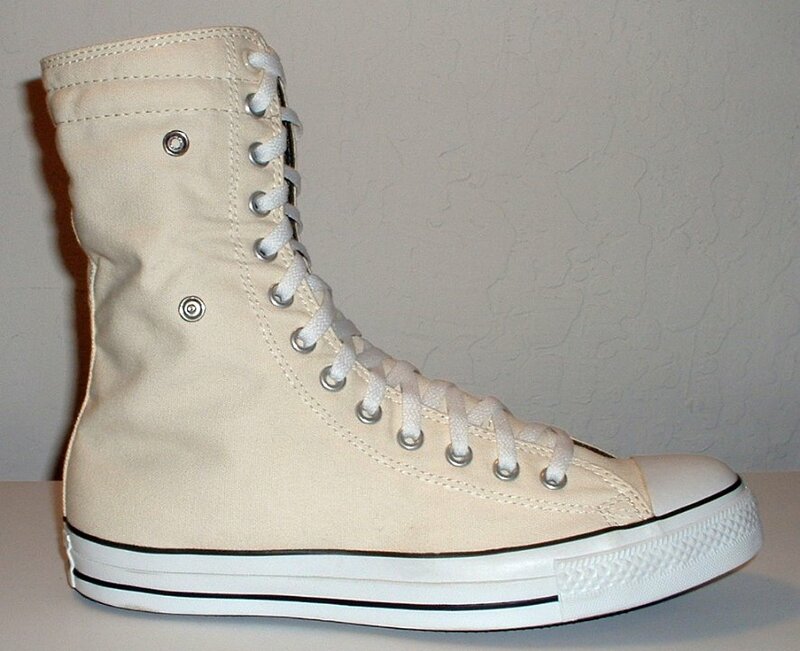 152 Knee High Chucks Angled side view of parchment and olive knee highs. 153 Knee High Chucks Rear view of parchment and olive knee highs. 154 Knee High Chucks Top view of parchment and olive knee highs. 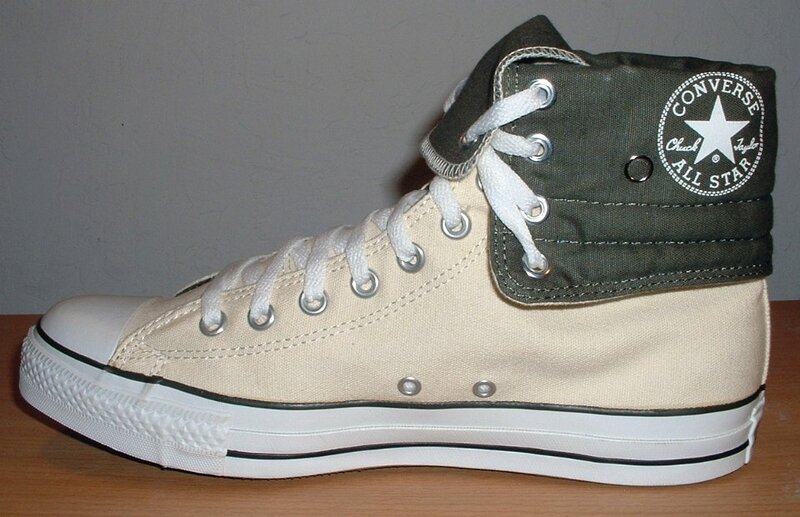 155 Knee High Chucks Inside patch views of parchment and olive knee highs. 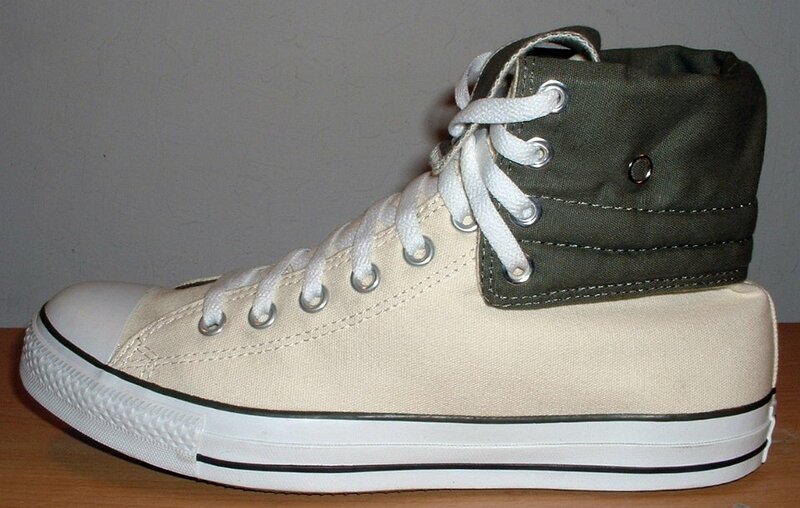 156 Knee High Chucks Angled front view of parchment and olive knee highs. 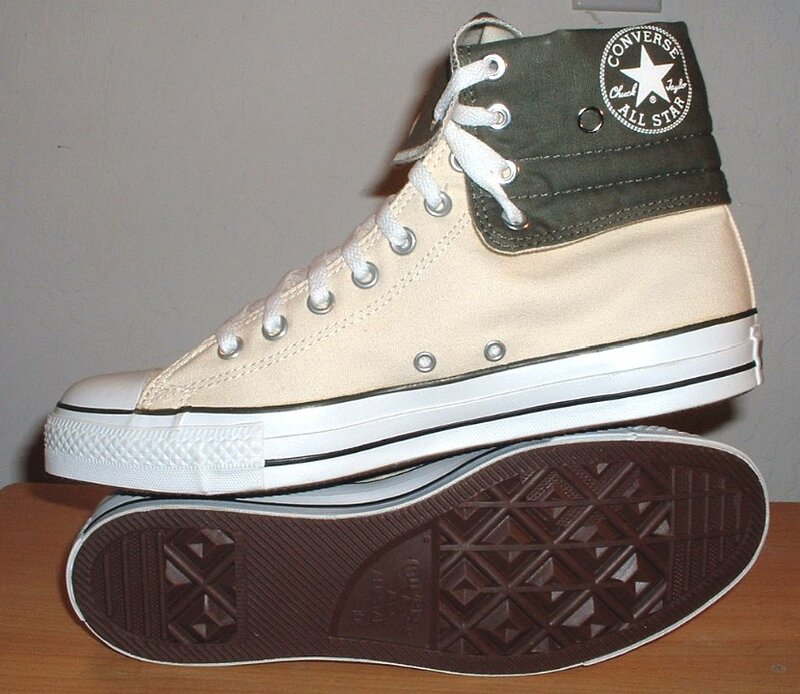 157 Knee High Chucks Inside patch and sole views of parchment and olive knee highs. 158 Knee High Chucks Inside patch view of a right parchment and olive knee high with inset of it rolled down. 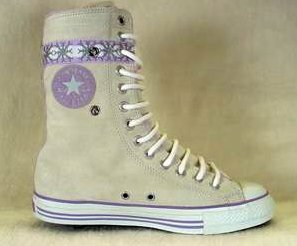 159 Knee High Chucks Inside patch view of a light purple and burgundy left knee high with burgundy and white laces. 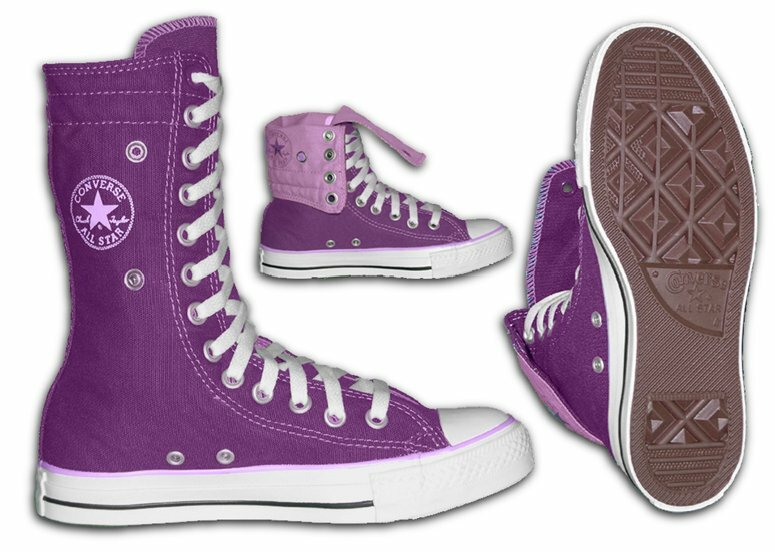 161 Knee High Chucks Purple and lilac knee highs, full height inside patch, folded down interior patch, and sole views. 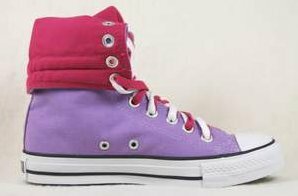 162 Knee High Chucks Purple suede knee high, left inside patch view. 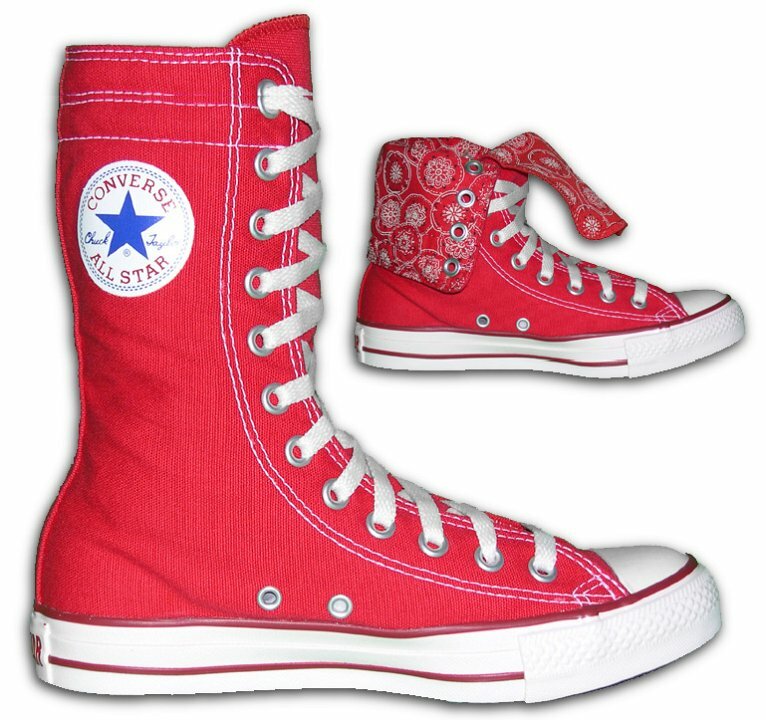 163 Knee High Chucks Red knee high with bandana interior, inside patch and folded down views. 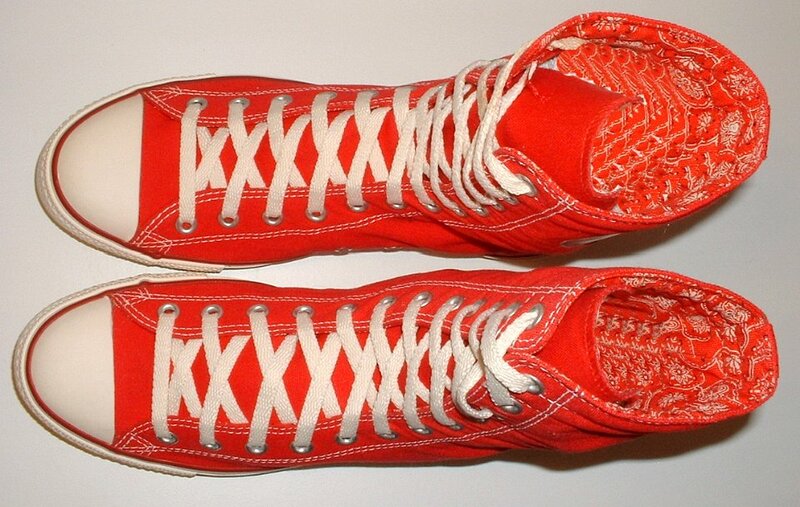 164 Knee High Chucks Inside patch view of a rolled down left red bandana knee high. 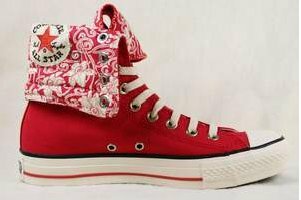 165 Knee High Chucks Inside patch view of a left red bandana knee high. 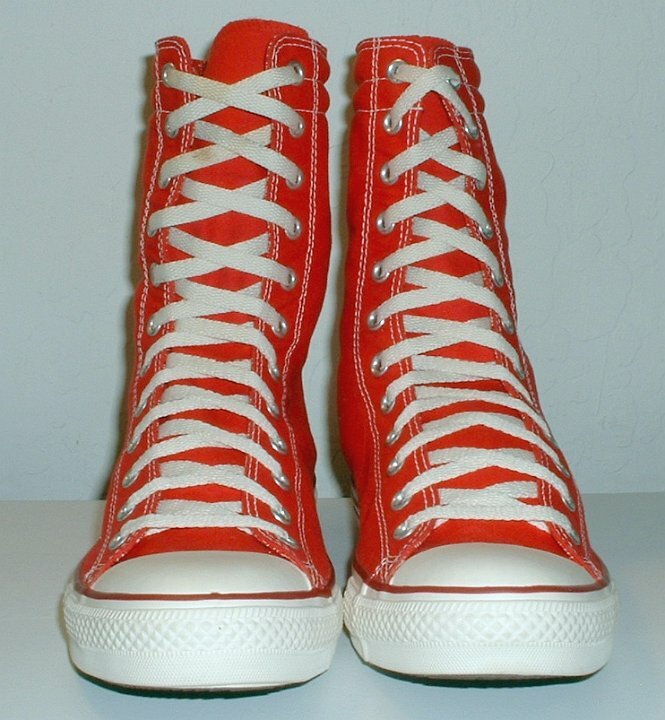 166 Knee High Chucks Outside view of a left red bandana knee high. 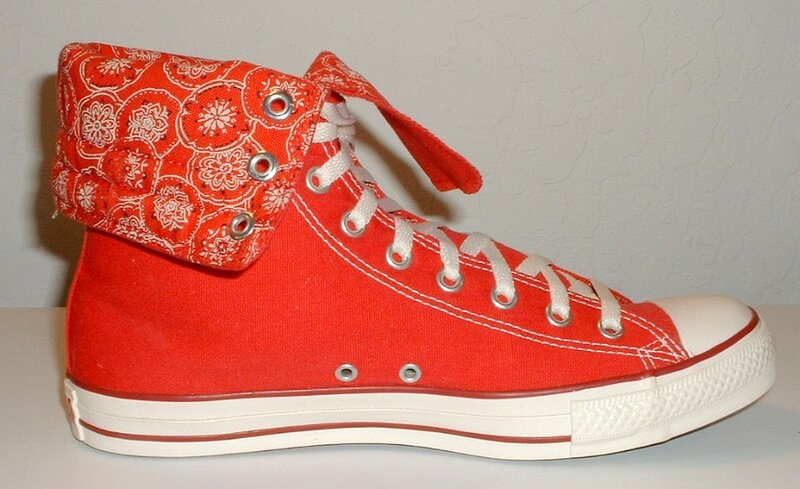 167 Knee High Chucks Inside patch view of a right red bandana knee high. 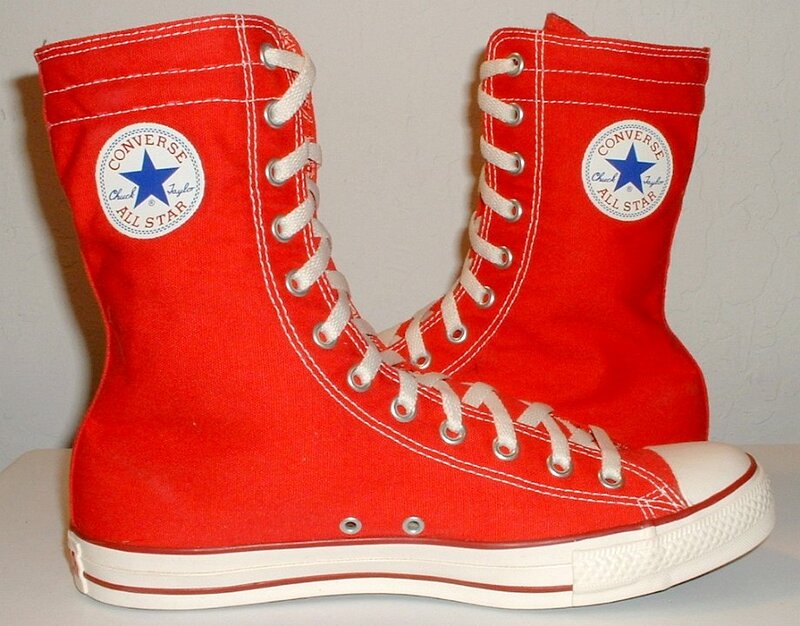 168 Knee High Chucks Outside view of a right red bandana knee high. 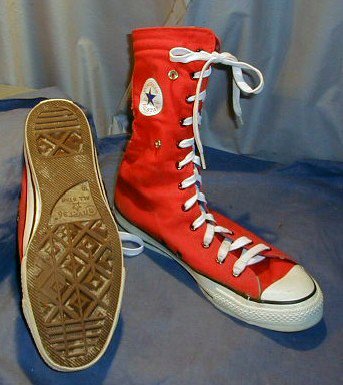 169 Knee High Chucks Rear view of red bandana knee high chucks. 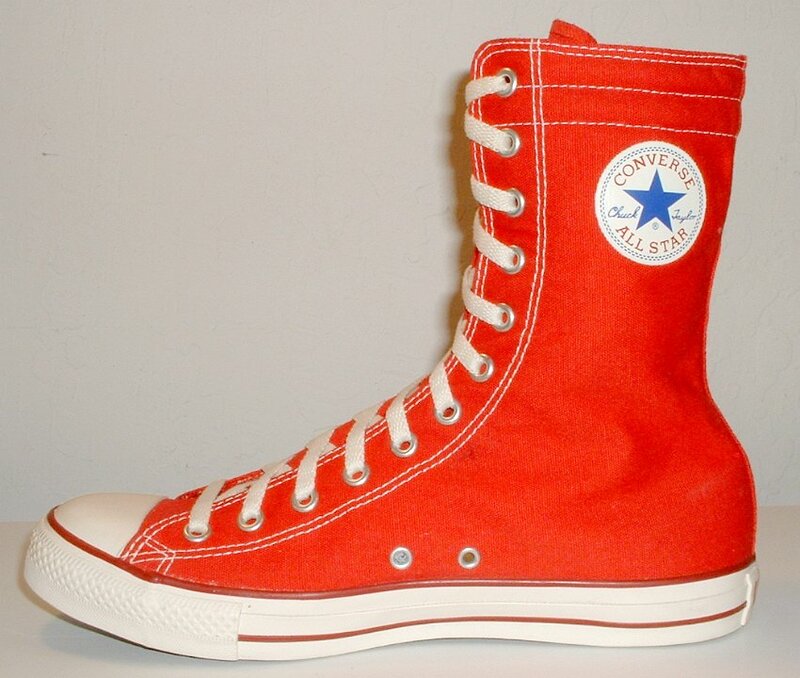 170 Knee High Chucks Front view of red bandana knee high chucks. 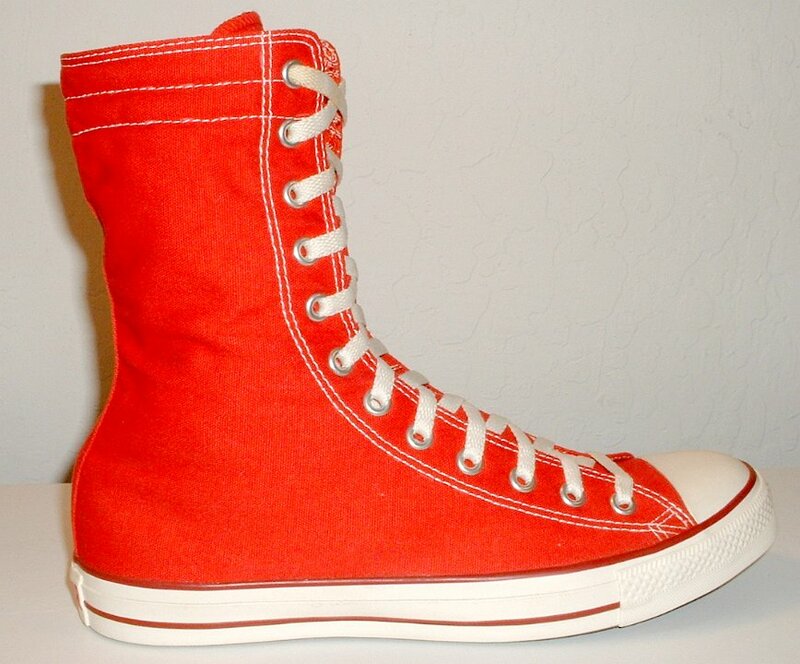 171 Knee High Chucks Angled side view of red bandana knee high chucks. 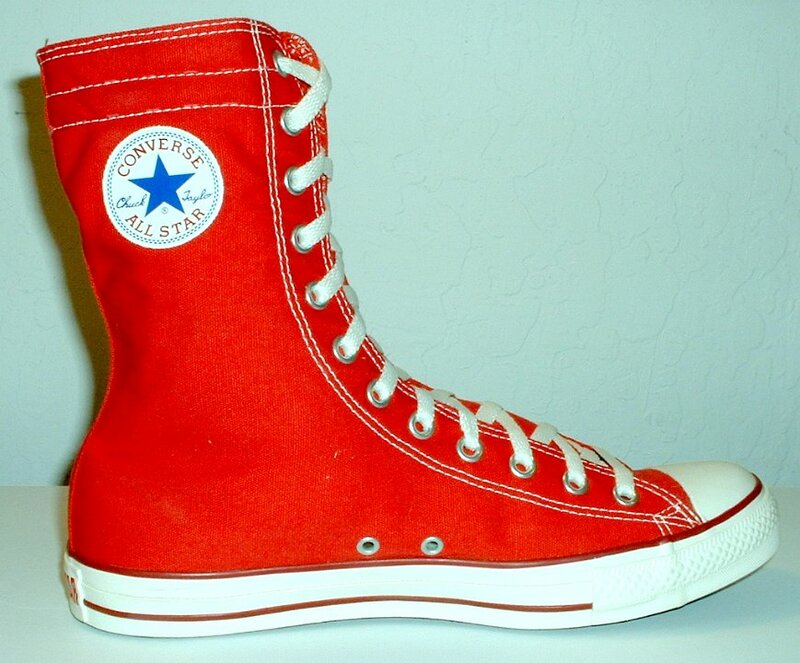 172 Knee High Chucks Top view of red bandana knee high chucks. 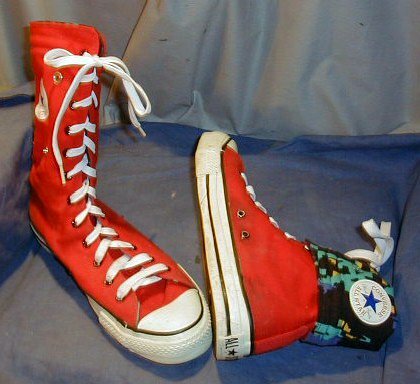 173 Knee High Chucks Inside patch views of red bandana knee high chucks. 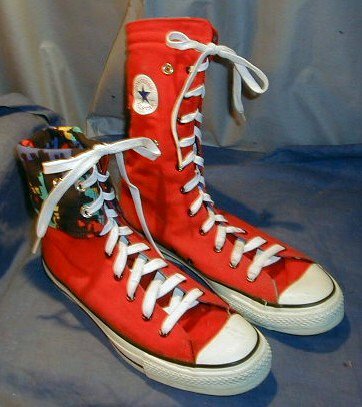 174 Knee High Chucks Angled front view of red bandana knee high chucks. 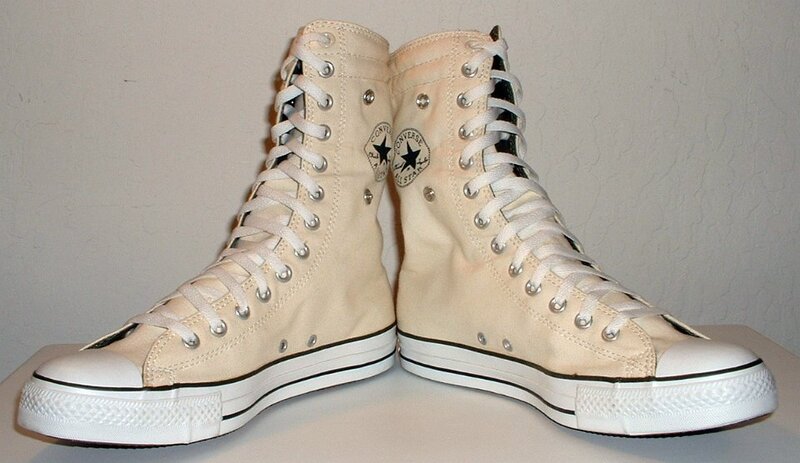 175 Knee High Chucks Inside patch and sole views of red bandana knee high chucks. 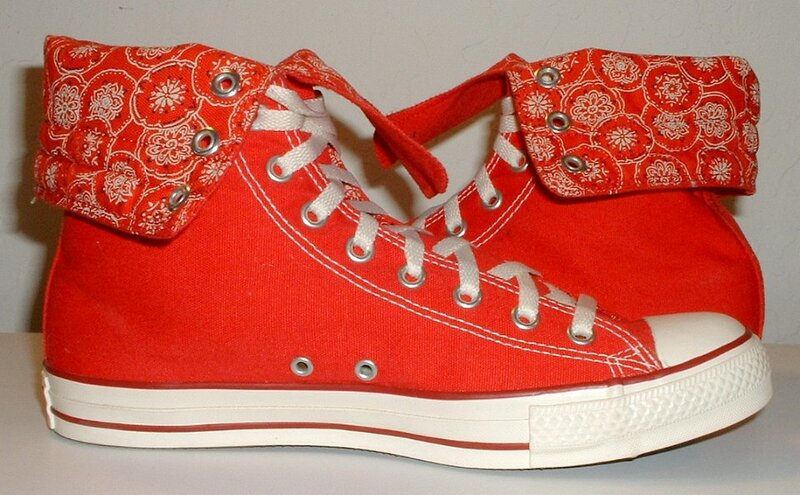 176 Knee High Chucks Side view of a folded down red bandana knee high chuck. 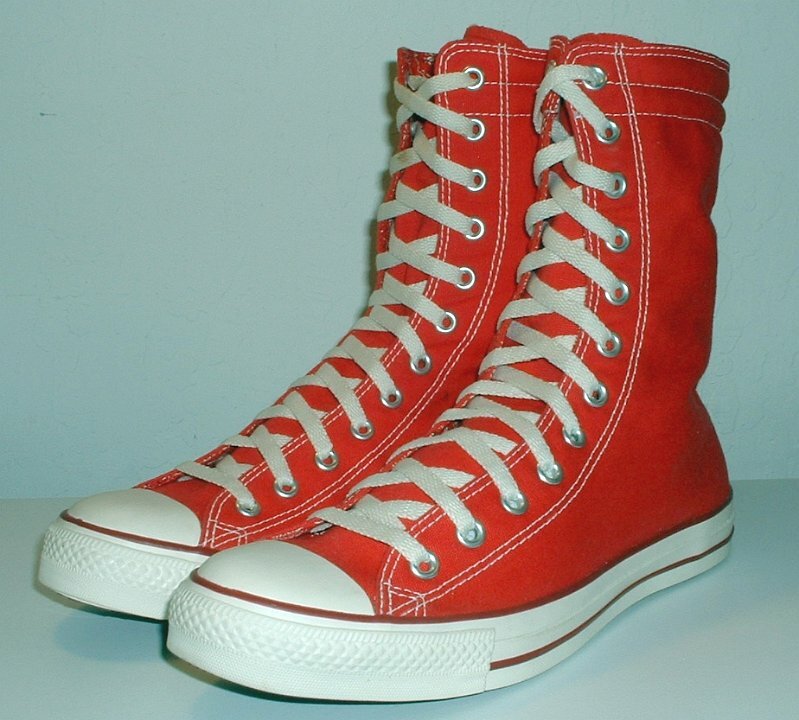 177 Knee High Chucks Side view of folded down red bandana knee high chucks. 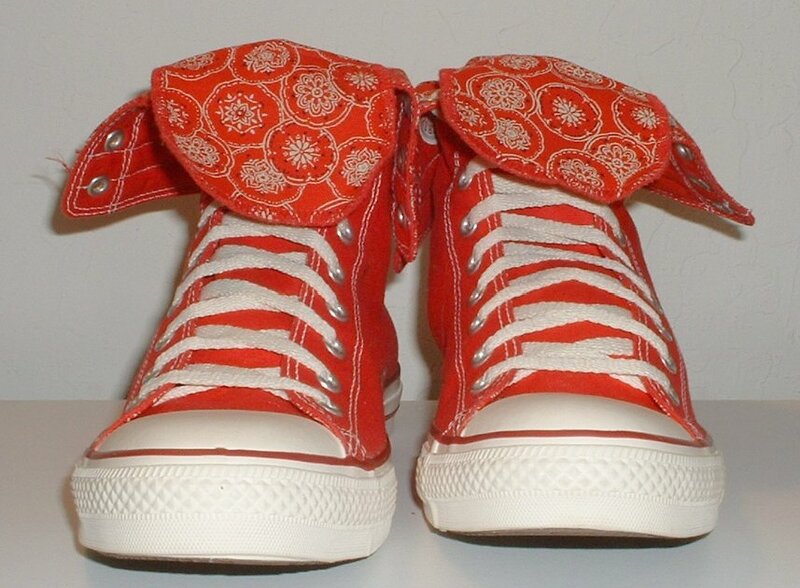 178 Knee High Chucks Front view of red bandana knee high chucks, folded down. 179 Knee High Chucks Inside patch view of a left red and plaid pattern knee high. 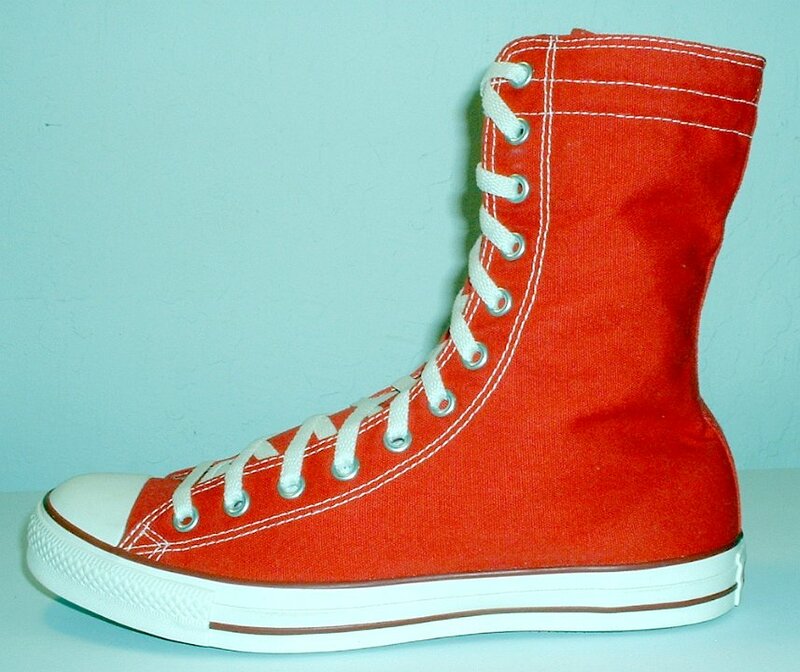 180 Knee High Chucks Red knee highs with pattern interior, angled side view. 181 Knee High Chucks Red knee highs with pattern interior, angled front and side views. 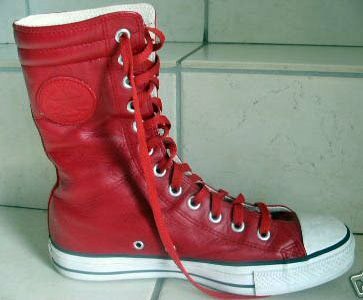 183 Knee High Chucks Left red monochrome leather knee high, inside patch view. 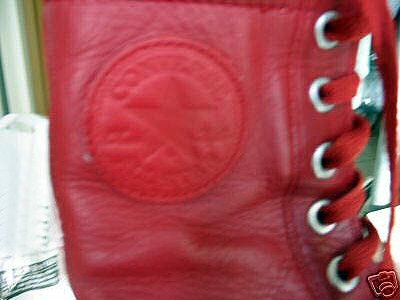 184 Knee High Chucks Closeup of the inside patch on a red monochrome leather knee high. 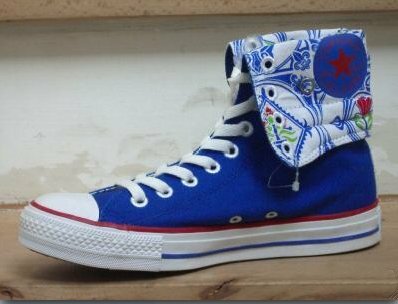 185 Knee High Chucks Inside patch view of a right royal blue and pattern knee high, folded down. 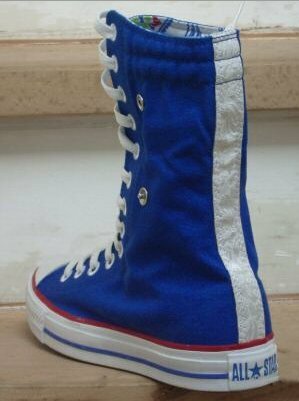 186 Knee High Chucks Inside patch view of a left royal blue and pattern knee high. 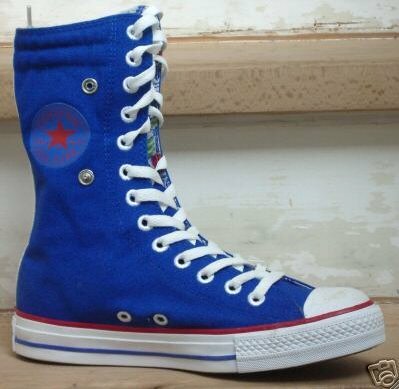 187 Knee High Chucks Angled rear view of a left royal blue and pattern knee high. 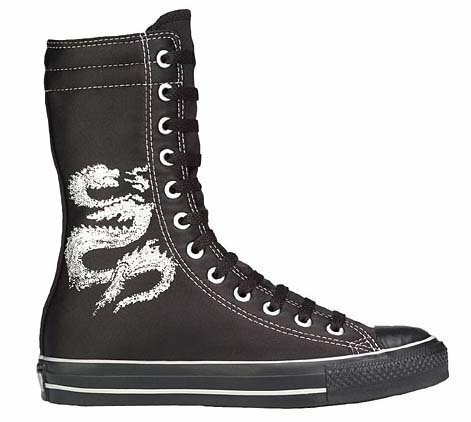 188 Knee High Chucks Monochrome black and white knee high with serpent design. 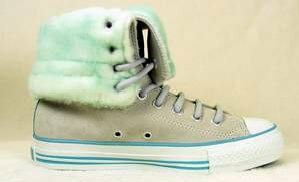 189 Knee High Chucks Tan and fleece knee high with aqua trim, folded down. 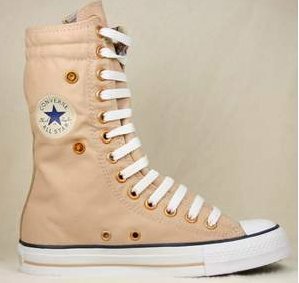 190 Knee High Chucks Right tan suede knee high, outside view. 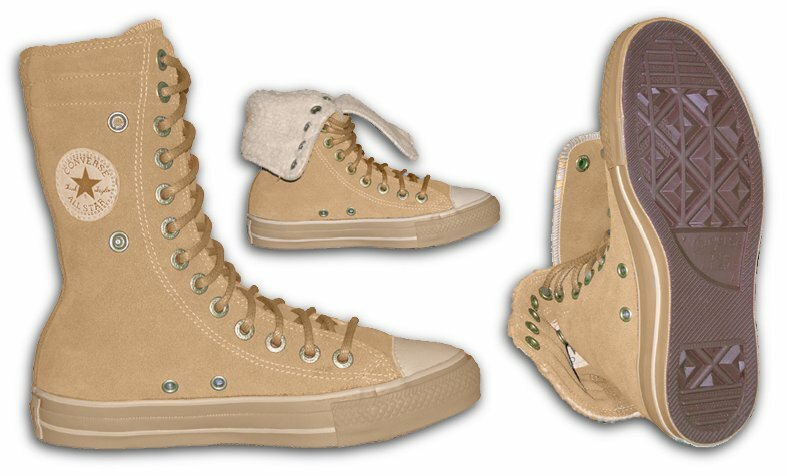 191 Knee High Chucks Right tan suede knee high, outside view. 192 Knee High Chucks Inside patch view of a left tan and plaid knee high, folded down. 193 Knee High Chucks Inside patch view of a left tan and purple knee high. 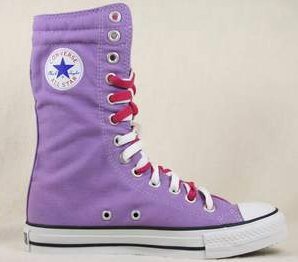 194 Knee High Chucks Outside view of a right tan and purple knee high, folded down. 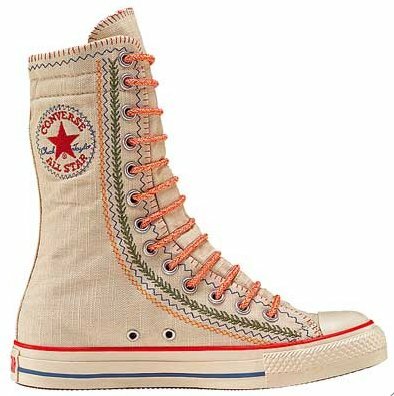 195 Knee High Chucks Inside patch view of a left tan and turquoise knee high. 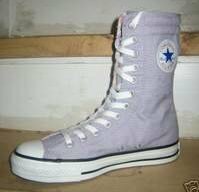 196 Knee High Chucks Inside patch view of a right white, grey, and light purple knee high. 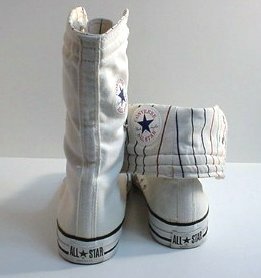 197 Knee High Chucks White knee highs with patterned interior, angled front view. 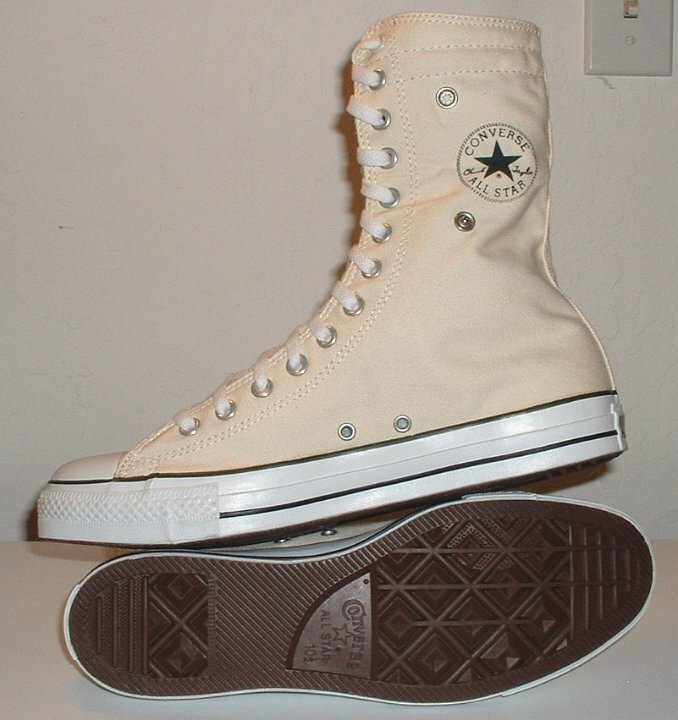 198 Knee High Chucks Angled top to side view of a left white knee high. 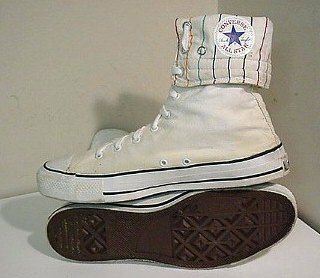 199 Knee High Chucks White knee highs showing right inside patch and left sole views. 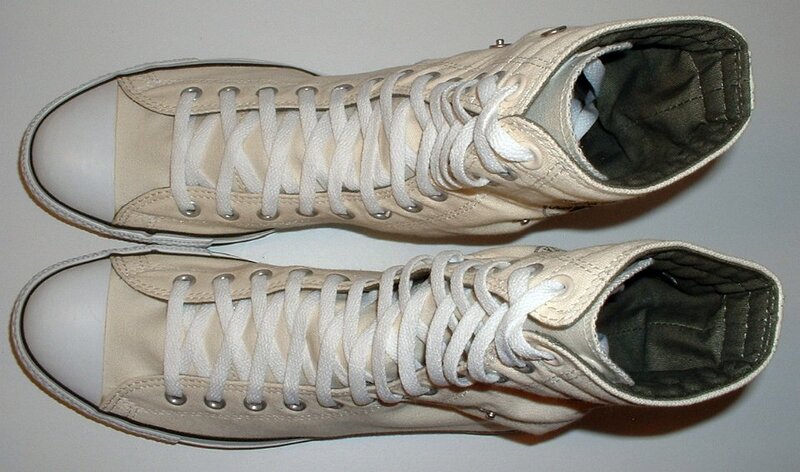 200 Knee High Chucks Close up of the interior patch and line pattern in a white knee high. 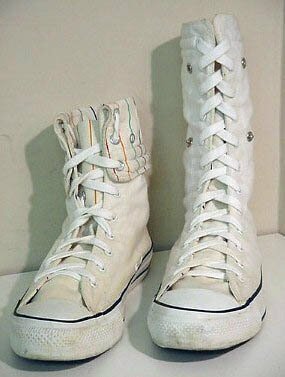 201 Knee High Chucks White knee highs with line pattern interior, front view of right folded down shoe and left full height shoe. 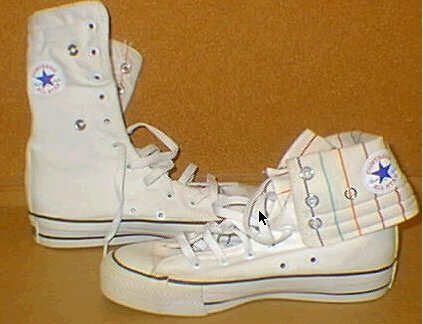 202 Knee High Chucks White knee highs with line pattern interior, full height left rear view and right folded down front view. 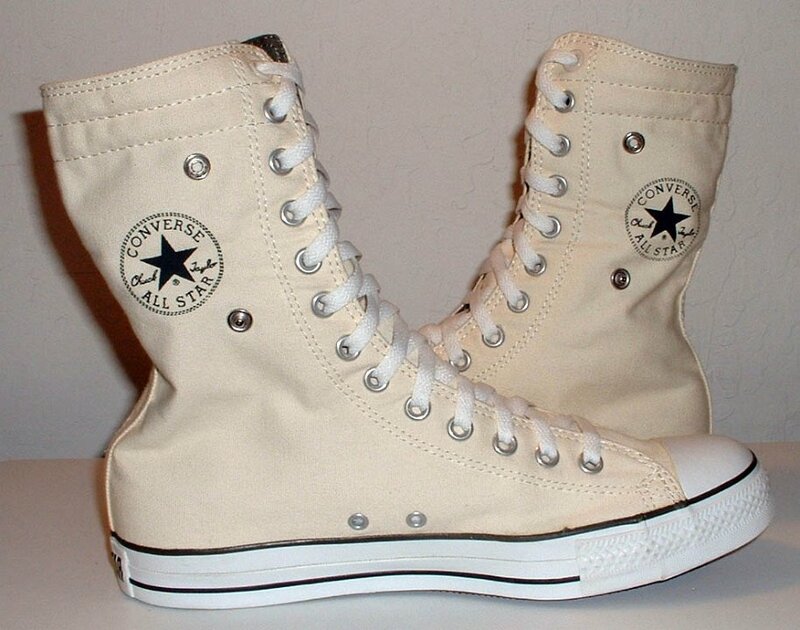 203 Knee High Chucks White knee highs with line pattern interior, folded down right and left sole views. 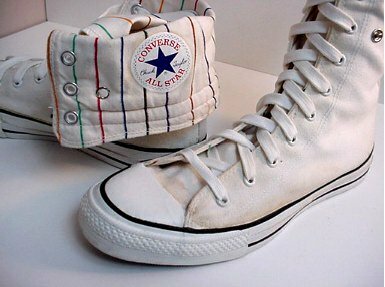 204 Knee High Chucks White knee highs with line pattern interior, right folded down and left inside patch views. 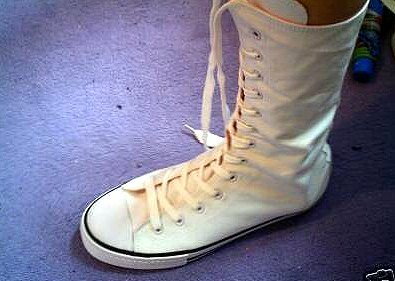 205 Knee High Chucks White knee highs with line pattern interior, rear view. 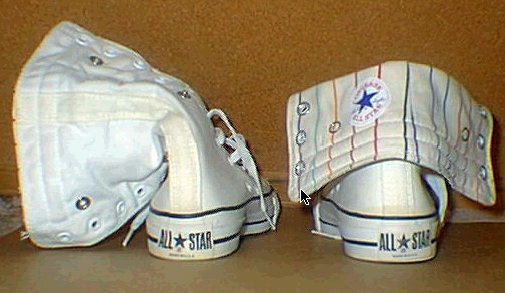 206 Knee High Chucks White knee highs with line pattern interior, angled right folded down interior patch view, and left outside view. 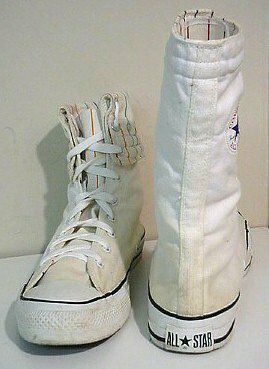 207 Knee High Chucks White knee highs with line pattern interior, angled side views. 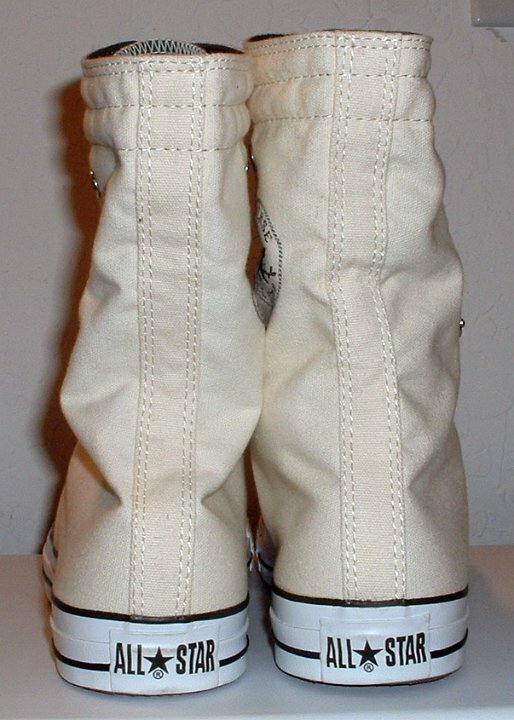 208 Knee High Chucks White knee highs with line pattern interior, rear view. 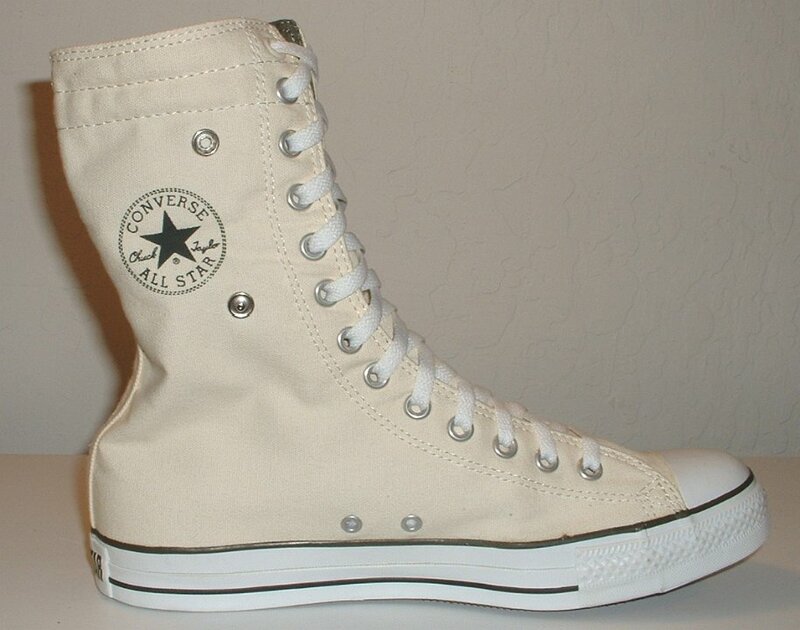 209 Knee High Chucks Natural white knee high, angled inside patch view. 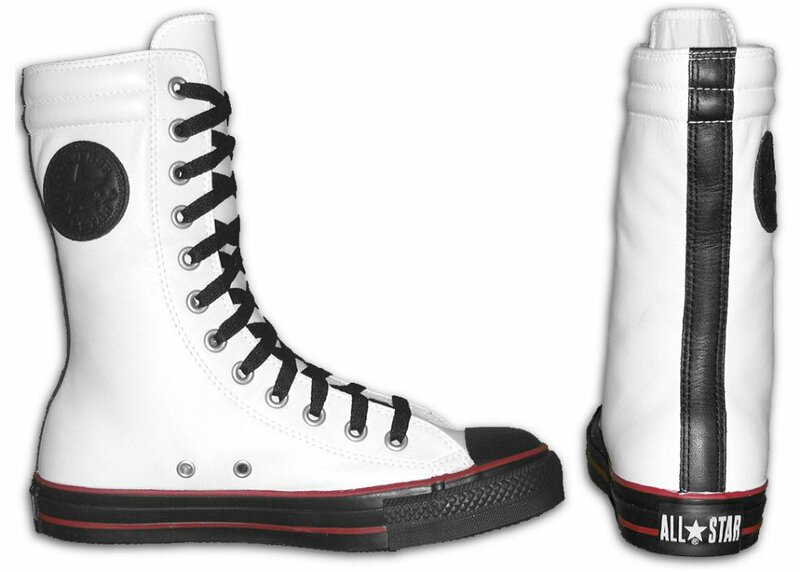 210 Knee High Chucks White and black leather knee high with red trim, inside patch and rear views. 211 Knee High Chucks Parchment monochrome left knee high, inside patch view. 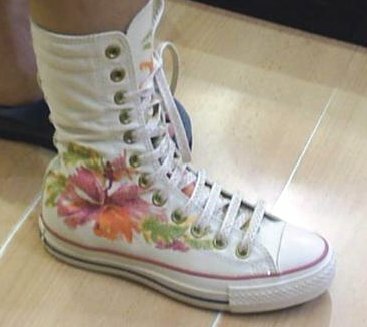 212 Knee High Chucks Optical white knee high with floral pattern, right outside view. 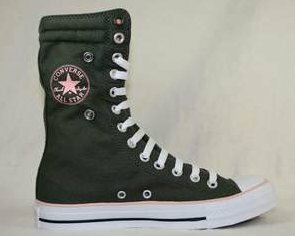 213 Knee High Chucks Side view of a white and pea green knee high with black and red trim. 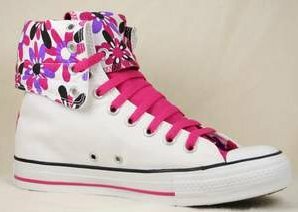 214 Knee High Chucks Folded down right white and floral pattern knee high with neon pink laces. 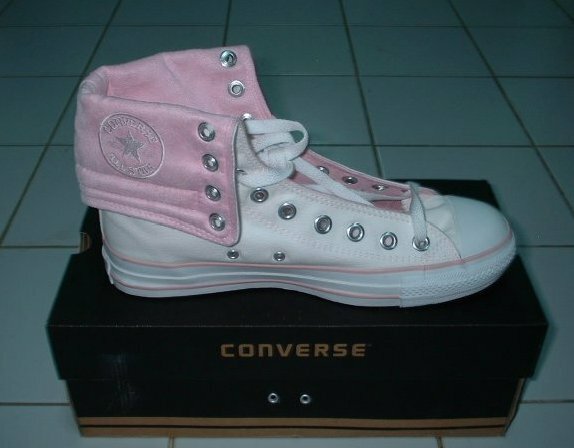 215 Knee High Chucks Inside patch view of a new left white and pink knee high, folded down. 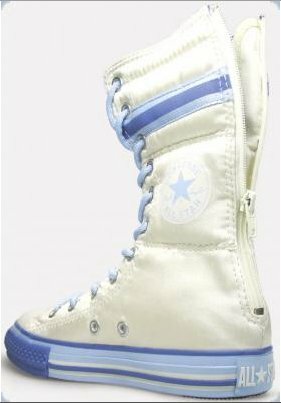 216 Knee High Chucks Rear view of a right white and blue trim right knee high with zipper back. 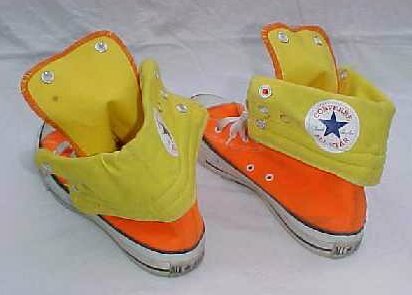 217 Knee High Chucks Angled side view of yellow and orange knee highs, folded down. 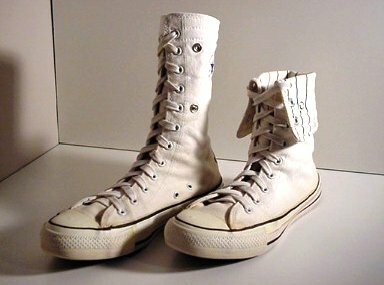 Knee high chucks were made in the USA for a time during the 1980s. 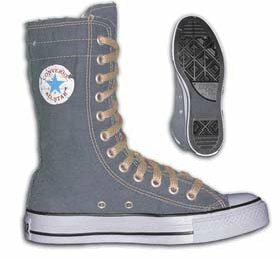 Knee highs are an extra high top shoe with 12 pairs of eyelets so you can lace all the way up to your knee. 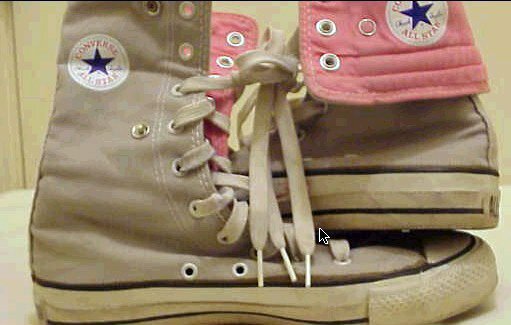 They also have a fold down position, and extra snaps are placed on the sides of the shoe to hold the canvas in place when you lace in the fold down position. 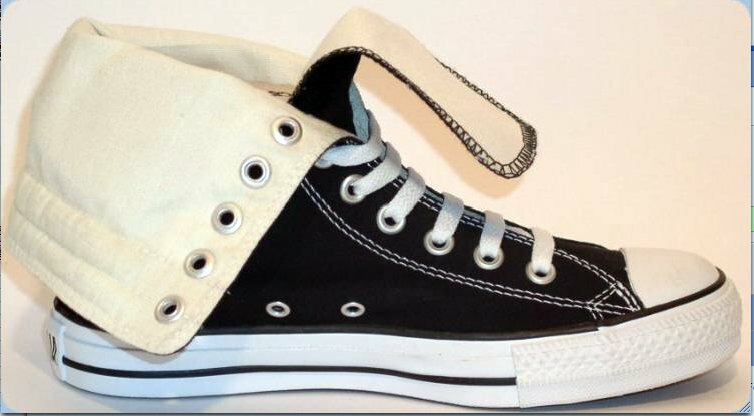 The traditional side patch is placed higher on the shoe, and there is a smaller interior patch in each shoe that is revealed when it is folded down. 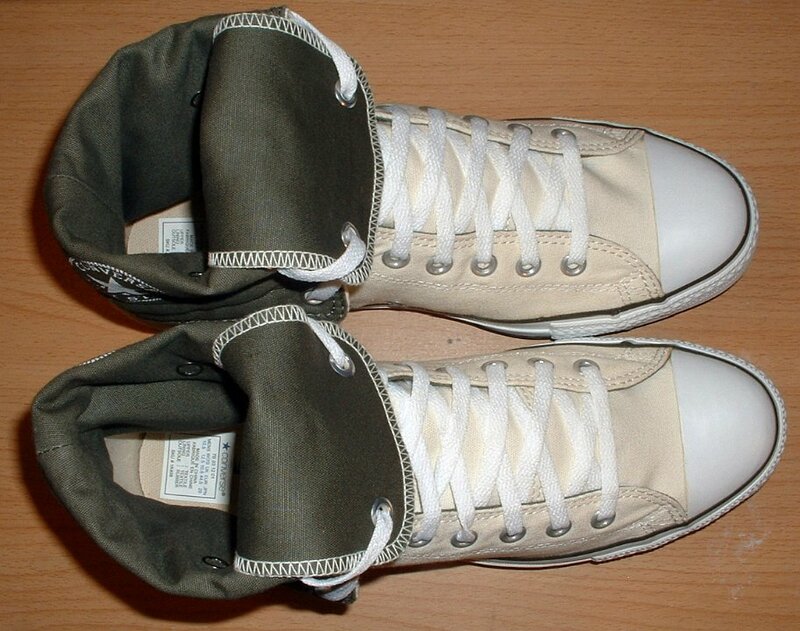 Many of the models feature a pattern or alternate color interior. 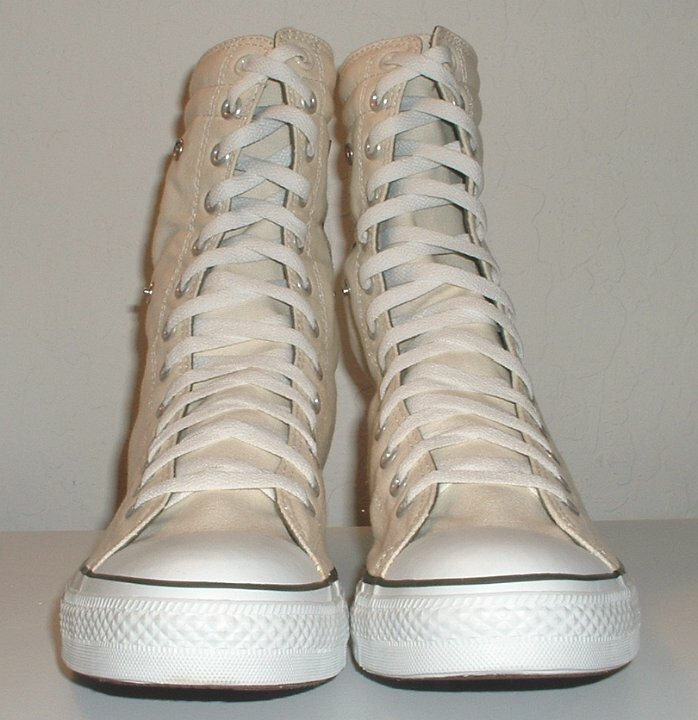 Knee high chucks were revived in 2003 by Converse, and have been made in both canvas and leather models, some based on the traditional knee high, and others emulating the monochrome look. They are mostly made in small batches and usually quickly sell out. Knee highs are very popular in Europe, and more models are made for that market than for the US market. 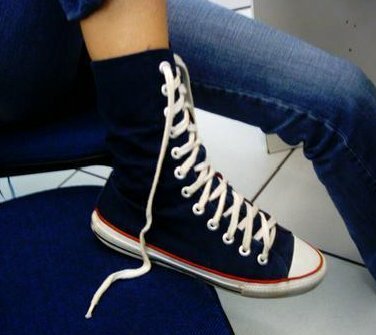 A few models are made just to be worn in the knee high position.